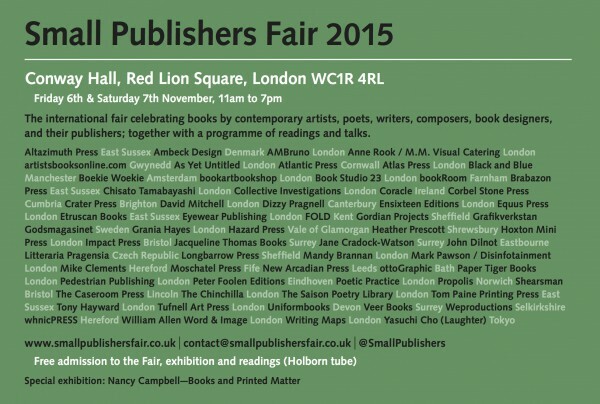 And my third outing this autumn will be to the Small Publishers’ Fair at Conway Hall on 6th and 7th November; I’ll be on the Artists Books Online stand with several other book artists, and I’ll be showing books from the small to the very large, all for sale and easily carried away. The fair is a thrilling annual event stuffed with beautiful, thought-provoking, imaginative, quirky and affordable artworks which would restore anybody’s faith in the vitality, diversity and inventiveness of the book arts, and indeed the multifarious imaginations of British artists, designers and makers working with text. There is always some kind of light contained within the dark. The painter Winifred Nicholson expressed this conviction through her work, painting light and colour with a visionary awareness, seeing everything with the joyful prismatic aura of living light: a ‘rainbow of light, rainbow of darkness’. The group of works brought together in light wells examines the relationship between the inner life and its outward expression, the light contained within the dark vessel, showing through the delicate, complex structure of the physical, like sunlight through the leaves. 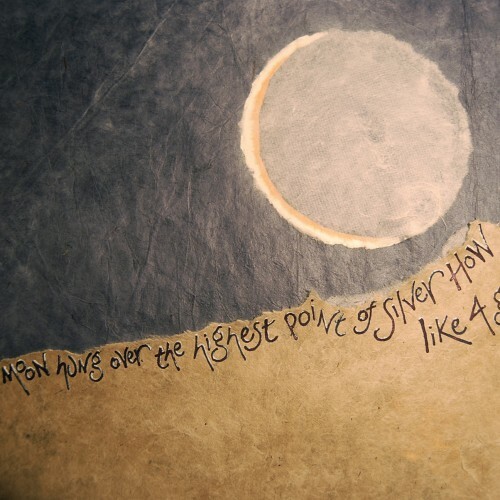 Sometimes the light is the natural light of the sun, moon or stars flooding the landscape, sometimes the glancing illumination of perception and insight, sometimes the visionary half-light of dreams. 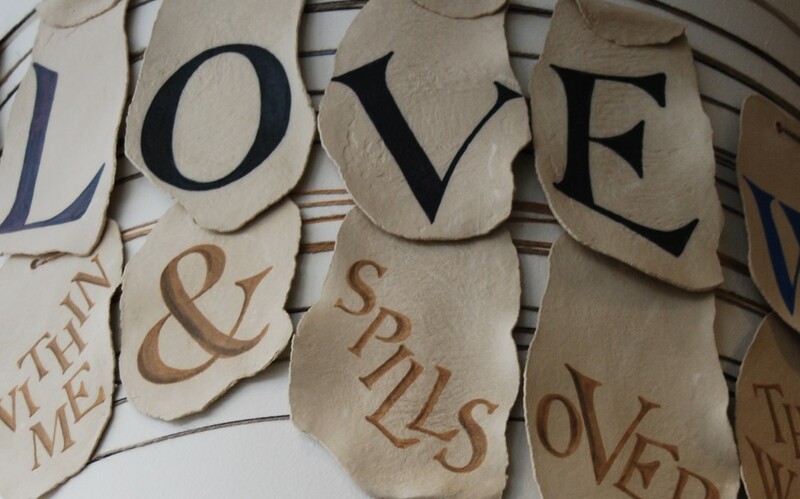 As a lettering artist, I work in clay, handmade paper and driftwood from the Thames, but my primary structural medium is words. 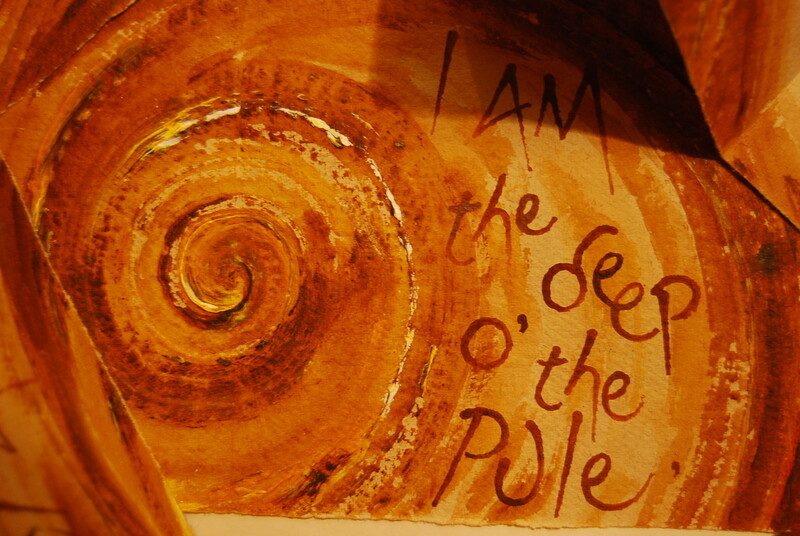 I see my work as a way of fishing the letters up from ‘the deep o’ the pule’, mapping their celestial dance, dredging them from the well, finding them in the driftwood’s grain – a way of seeing the light in thought, word and physical form. In this collection I have worked with texts about perception – how the light falls on the mind’s eye; about perspective – how we individually interpret what we all see; and about imagination – the light within. 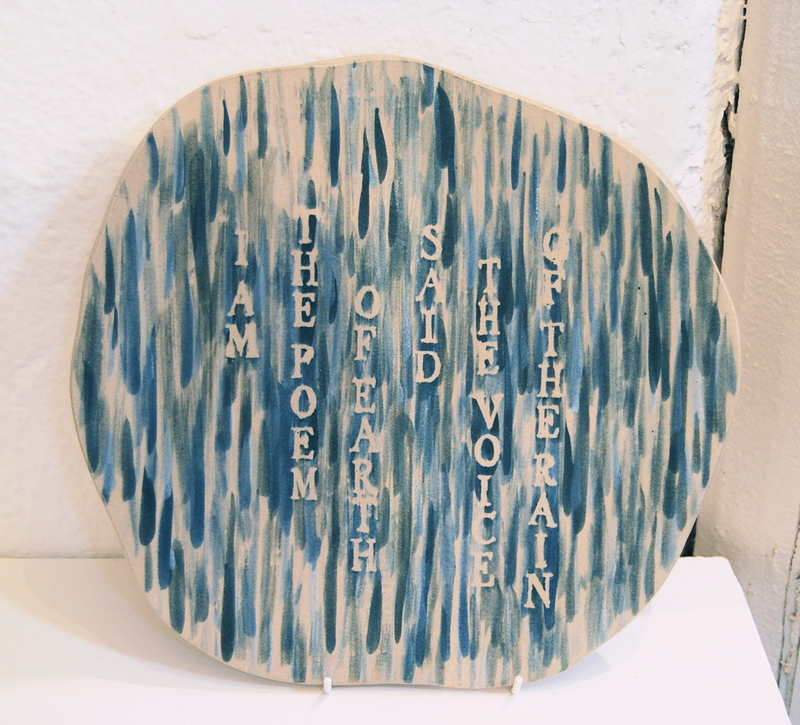 Each text inspires a different form, or physical means of expression: sometimes the text will suggest to me the containment of the vessel, the earthy embodiment of clay, the cosmic transformation of the fire, the circling flow of the throwing process. 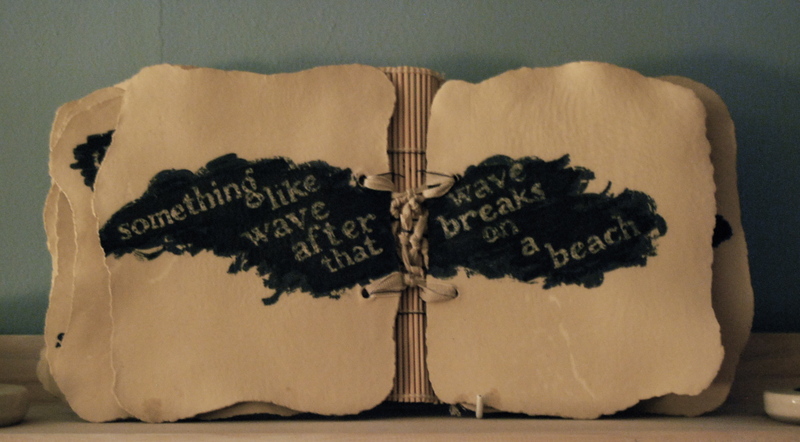 Other texts suggest the light-bearing transparencies of the paper, or the spiralling sequence of the pages of an artist’s book, or the dual-natured transitional form of water-carved driftwood. 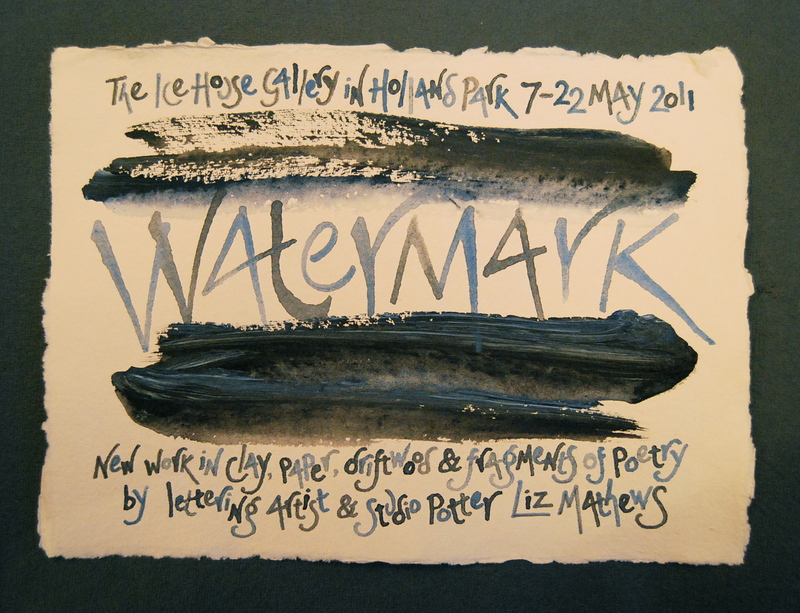 With each text, I seek to give an initial impression of its meaning (the ‘whole’ image), which is confirmed and deepened by a more considered reading – so that the text is literally ‘read’ as integral to the form of the work, and the word-by-word or letter-by-letter details become structural elements in linked sequence. 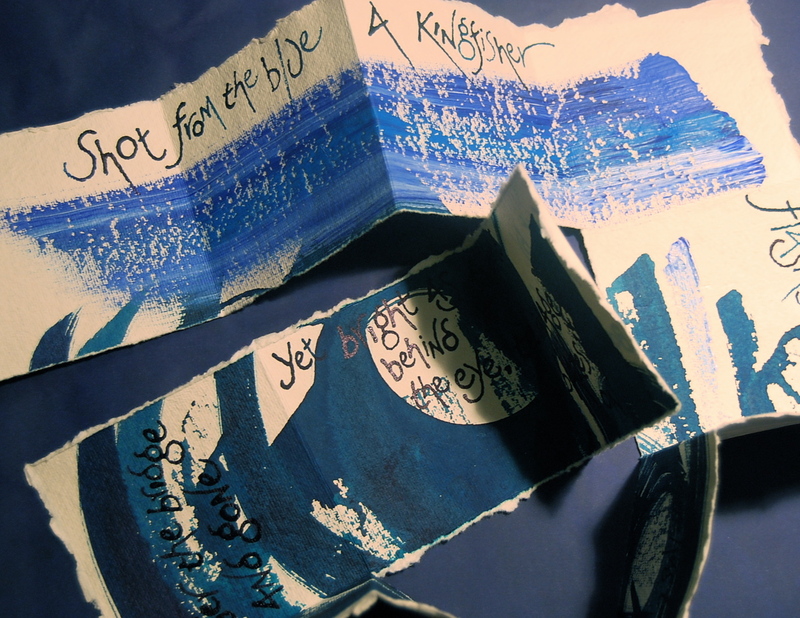 Most of my artist’s books are made from a single whole sheet of handmade paper, which is folded, painted, lettered and torn into a sequence of pages; it’s important that it can be reformed and seen as a whole image, that its integrity is unbroken, but it also can be read as a flowing sequence of pages, allowing the reader to turn and handle the painting as a book with all the enjoyment of its feel as a space-containing ‘volume’. 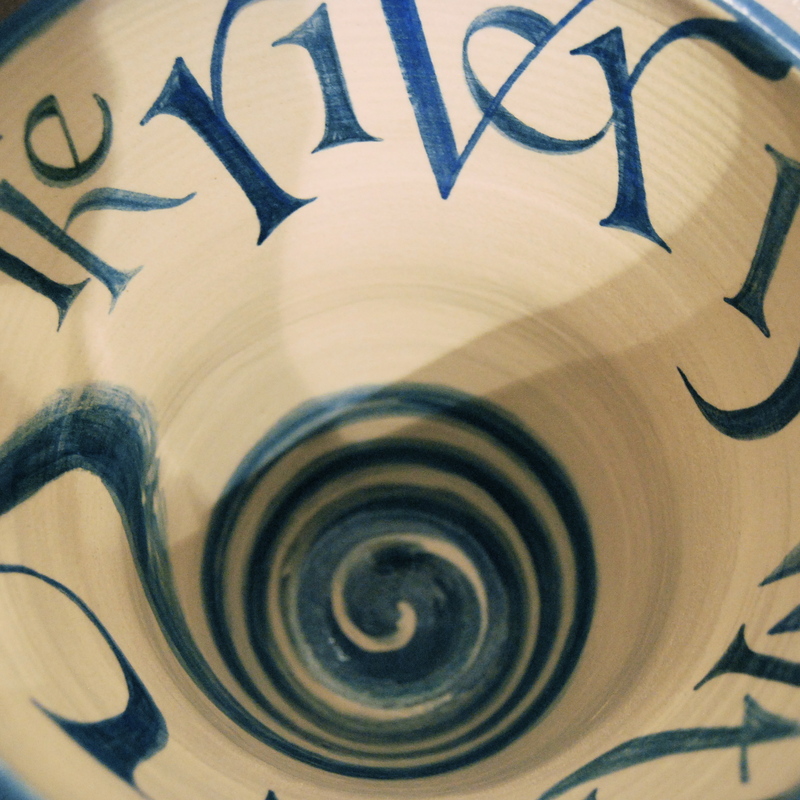 I like the link here between the pages’ spiralling flow and the inner spiral of the clay vessel’s thrown form: this is reflected and brought to the surface with the setting of the lettering flowing round the vessel, drawing the reader into an awareness of its physical form, dimensions, weight, volume, in the act of reading the text. 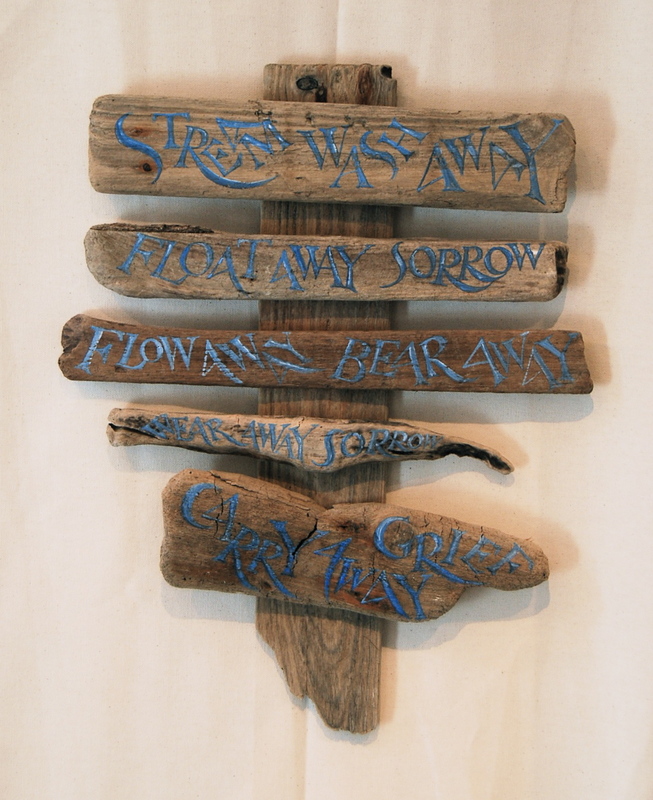 On paper, I use an unconventional lot of mark-making tools, including wooden clothespegs, chopsticks, slate shards, feather quills – and my favourite lettering ‘pen’ is a little driftwood stick picked up on a beach of the Thames. 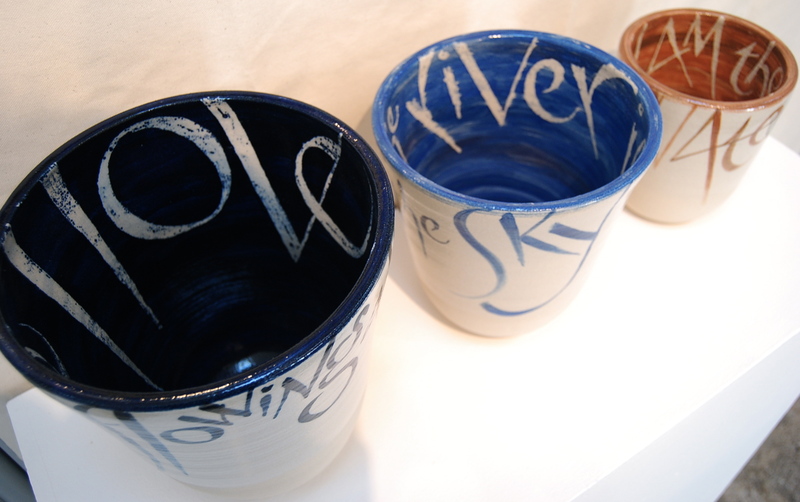 On the clay, I always letter with a brush, freehand onto the raw dried pot. 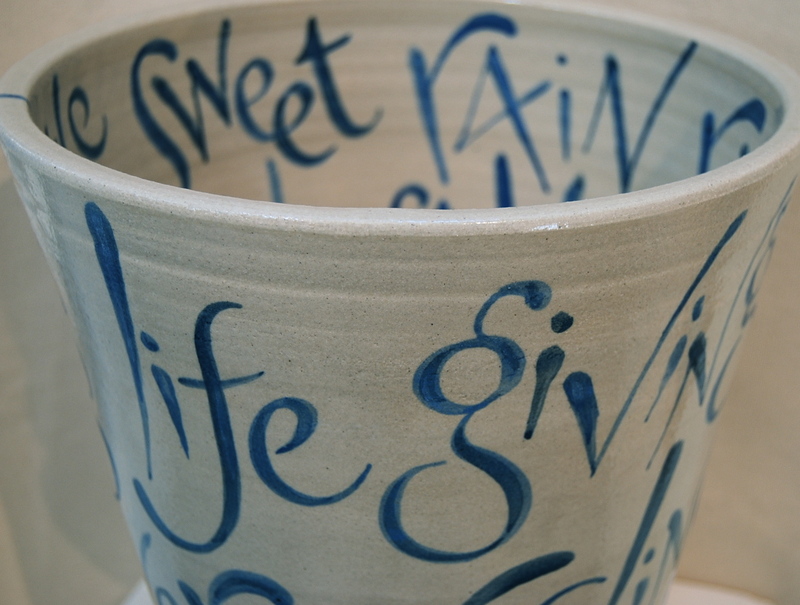 I love unglazed clay – its stoney feel, colour and texture – and I like to let it breathe, to allow the fire deep in. But the glazed clay has its own light-bearing, wetness-remembering qualities, too – I like the two feelings to coexist in a pot. 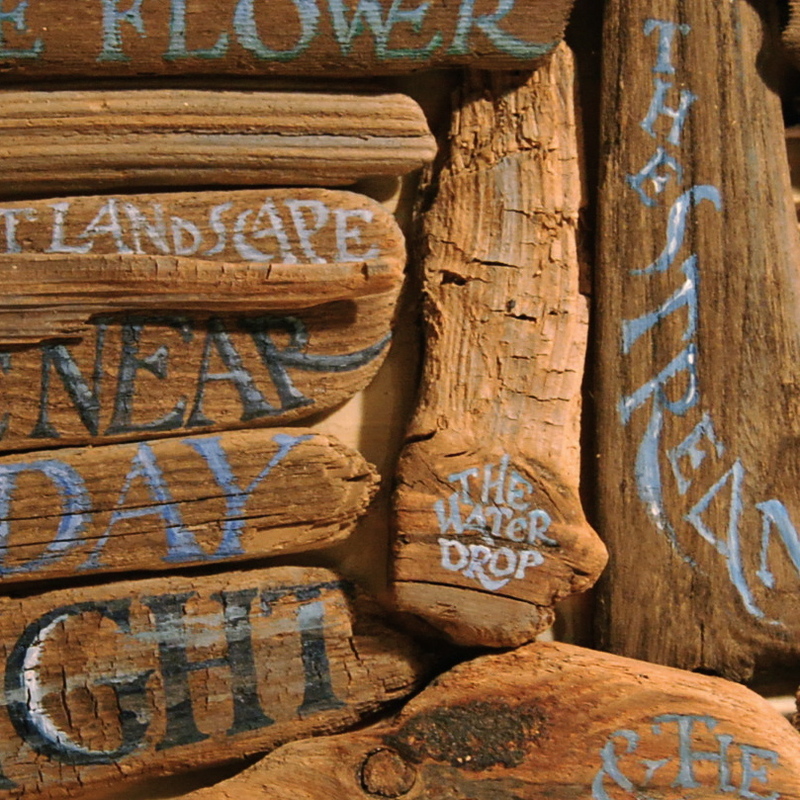 When I’m working with driftwood, I don’t interfere with the river’s carving, except to incise or highlight the lettering; the beautiful shapes formed by the tree’s growth and the water’s intervention seem to hold the letters of the text within the grain, waiting to be revealed. 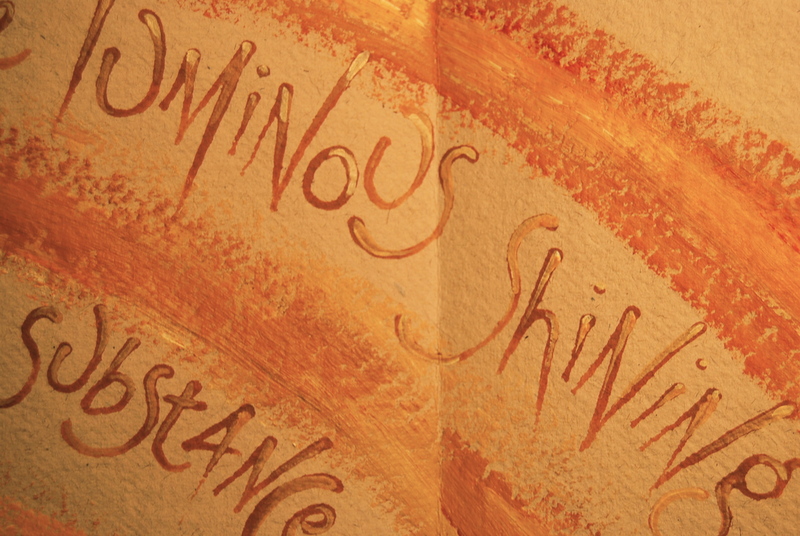 And when I’m working with paper, I like to let the light show through from the ground. 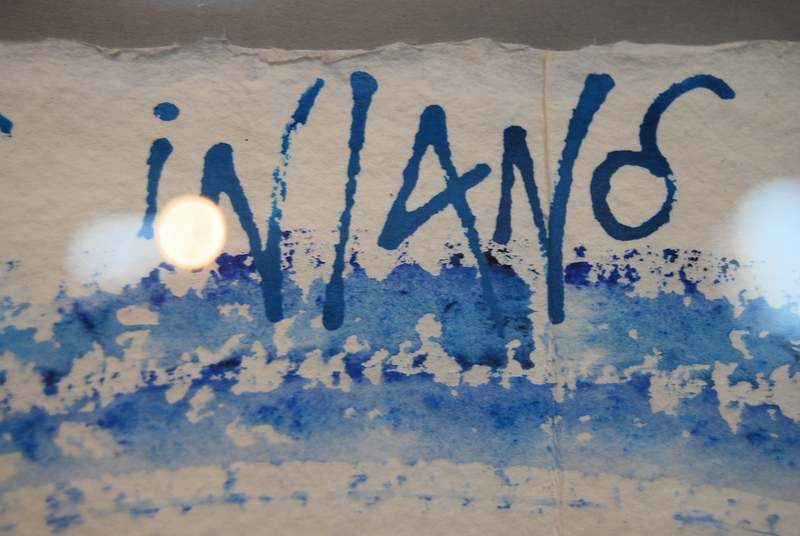 I love the handmade paper’s responsiveness, how it soaks up or resists the colour, how its texture affects the flow of the ink, how it meets me halfway, instead of sitting there impassively waiting to be painted on. 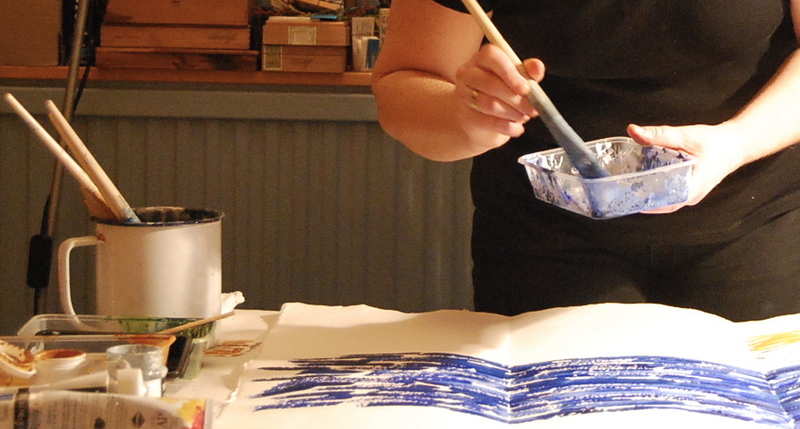 I love a bit of unpredictability in something I’m making – I want it to have a life of its own. With June, true summer begins. John Clare’s lines from A Shepherds Calendar (June poem) capture for me not only the sights and sounds, but the feeling of the month. 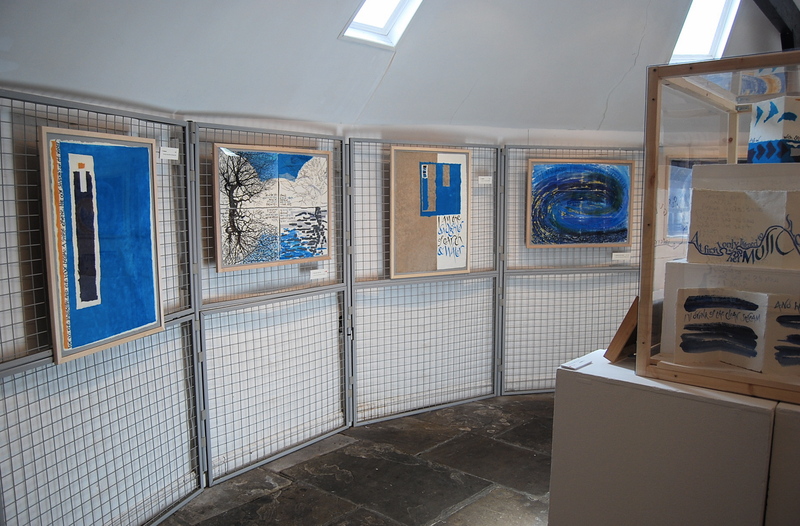 We are enjoying being back in the studio after our maytime excursion to the Ice House in Holland Park, where my Watermark exhibition was the first show of the summer season. 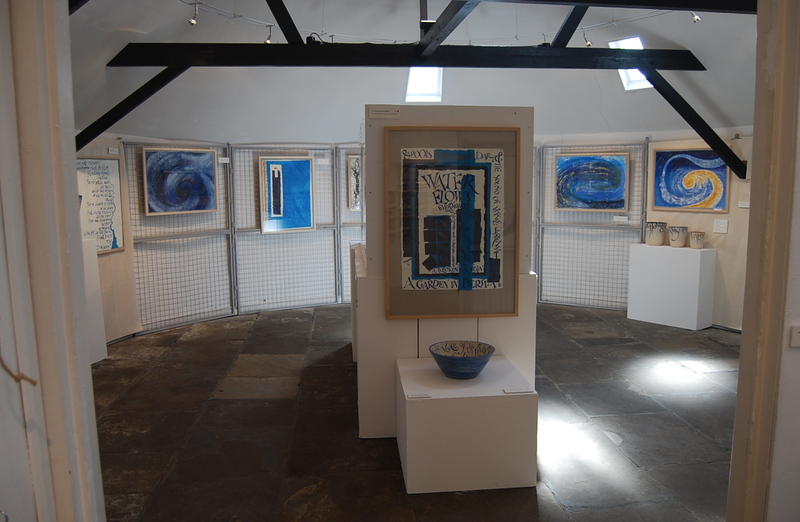 This month, I’d like to give you a tour of the exhibition, to show how it worked in that beautiful space. 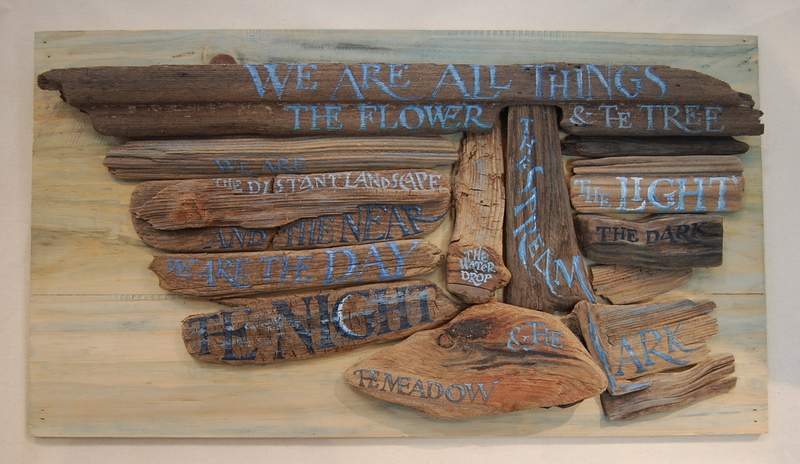 This image of one of my driftwood sculptures was on posters throughout the park, leading to the Ice House. 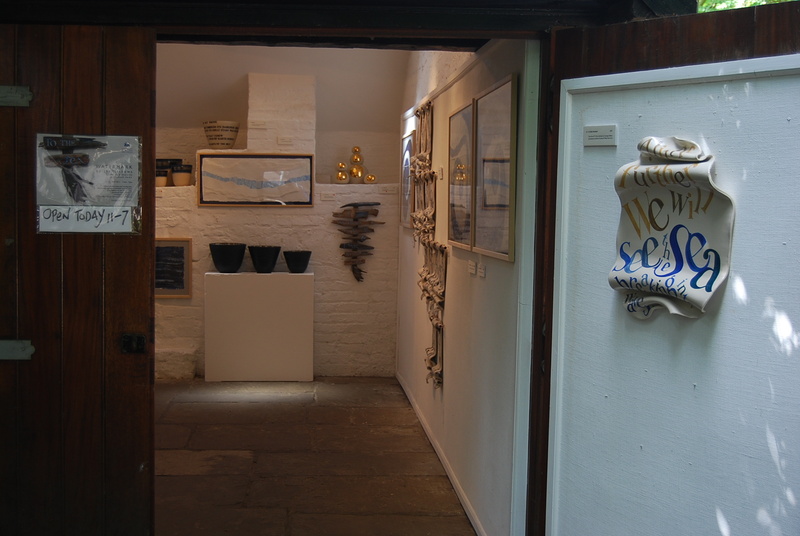 The entrance to the Ice House. 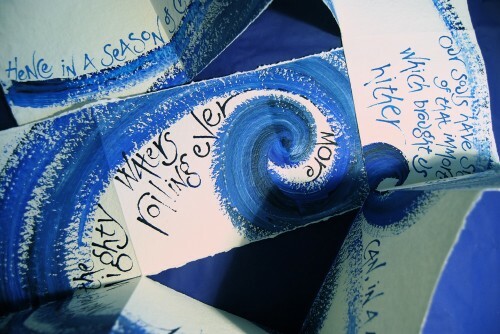 All of the work was connected by the theme of water, in the poems, in the materials, in our bodies, and running through our lives, from source to sea. 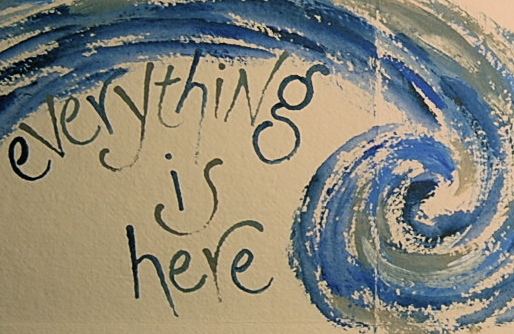 Implicit in each beginning is its end. 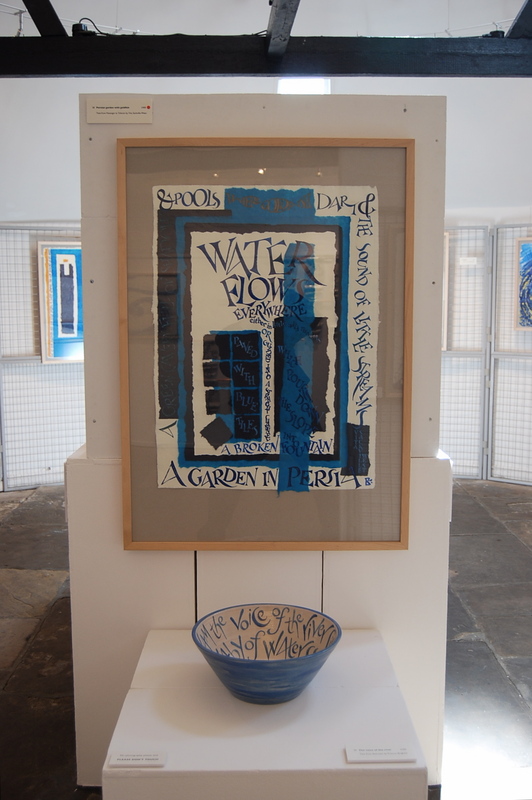 Living water, a waterfall in clay with a vivid text by Vita Sackville-West flowing down like leaves down a stream. 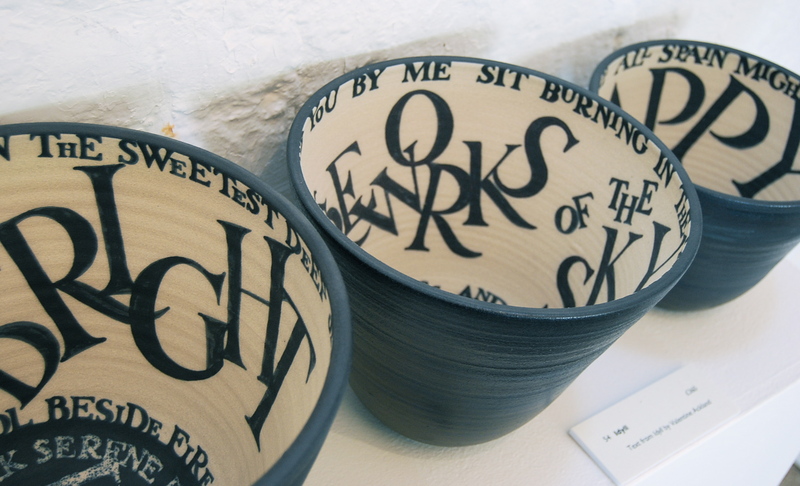 This form of book, where the text moves round in a continuous circling flow, and the paper, though shaped by hand, retains its wholeness, has for me some structural relation to the pots thrown on the wheel, and the spiralling setting of their text. 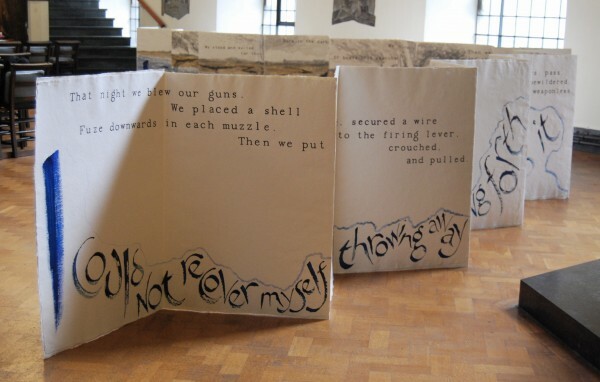 I enjoyed showing visitors the way that the book opens page by page, and then reforms into a whole image. 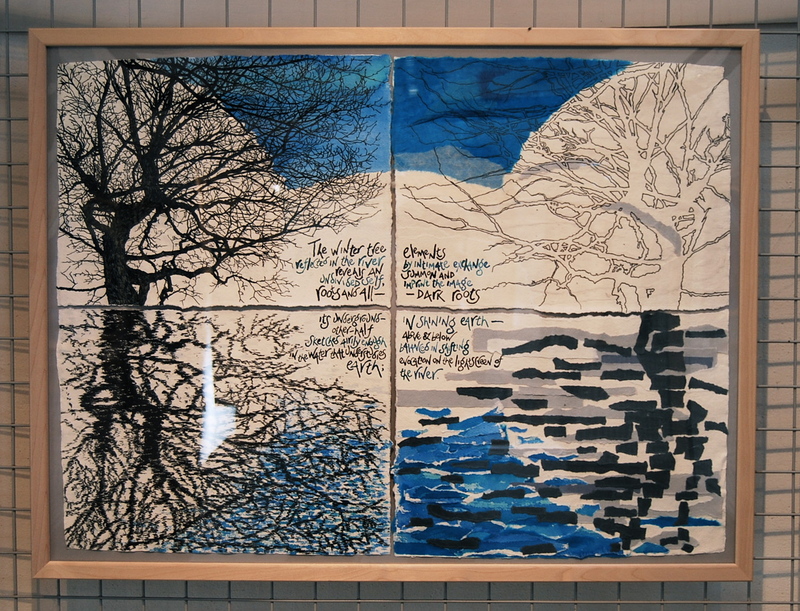 Here the image in four parts develops with the text, in a four-way reflection. 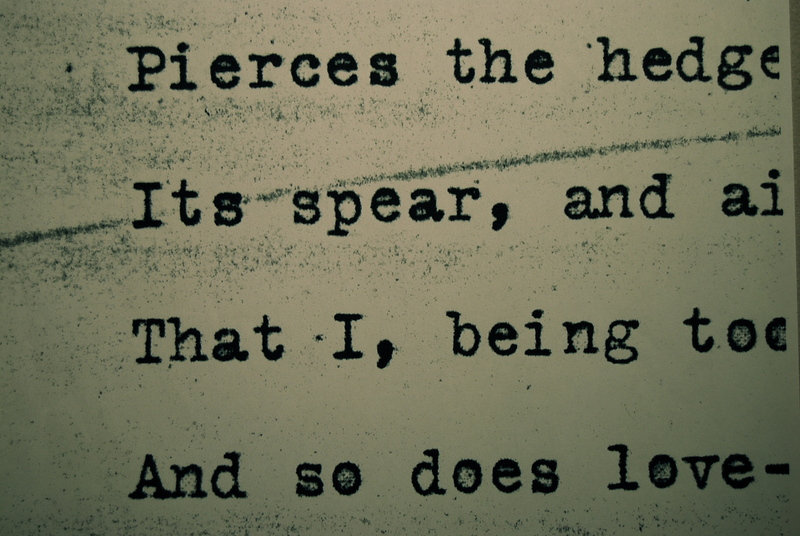 with Kingfisher, a brilliant text by Richard Price, in the end frame. 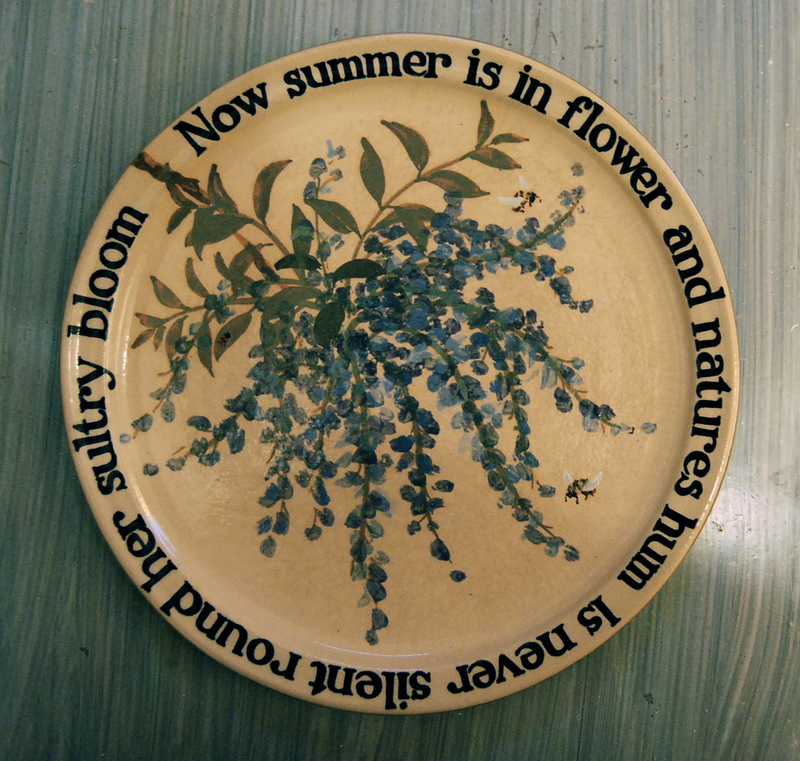 John Clare’s May poem in his Shepherds Calendar evokes the delights of this lovely month, and here I’ve set a fragment of text around the flared rim of a salad bowl, garnished with may blossom, flowering rosemary, dill and early lavender. 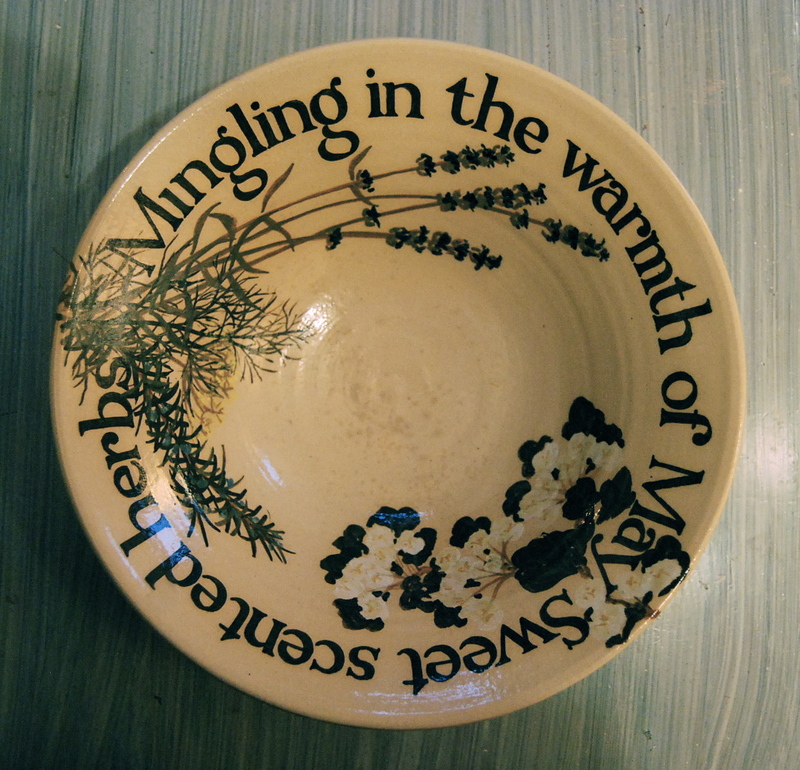 This bowl is part of our dinner service, which has a plate or bowl for every month, and I’m starting each month’s post this year with the appropriate piece. 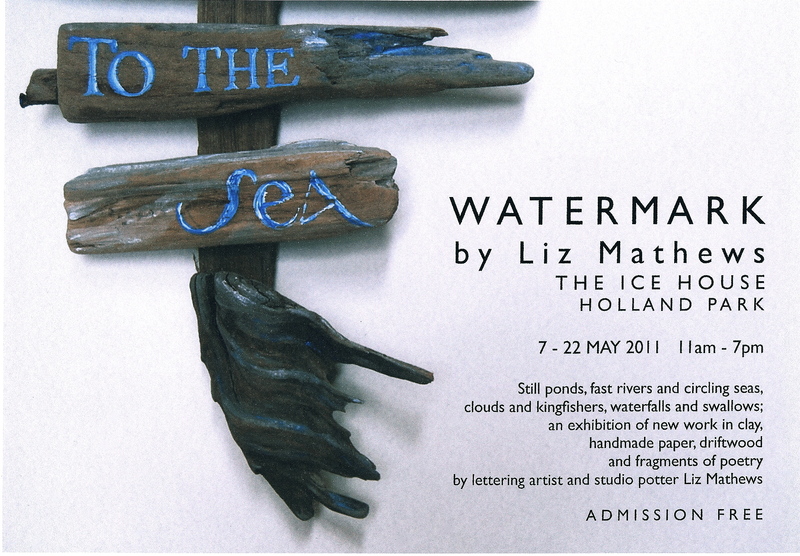 Everything seems to have come early this year, including May itself, and we will be ‘mingling in the warmth of May’ in Holland Park, as my new exhibition Watermark opens on 7th and closes on 22nd May, presented in association with the Royal Borough of Kensington and Chelsea. 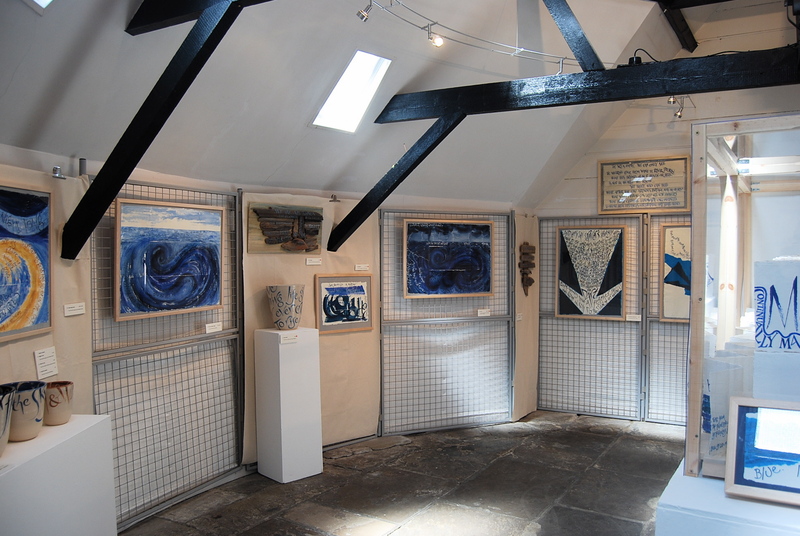 The Ice House gallery is a beautiful space, a one room house built in beautiful brick with a cone-shaped tiled roof. 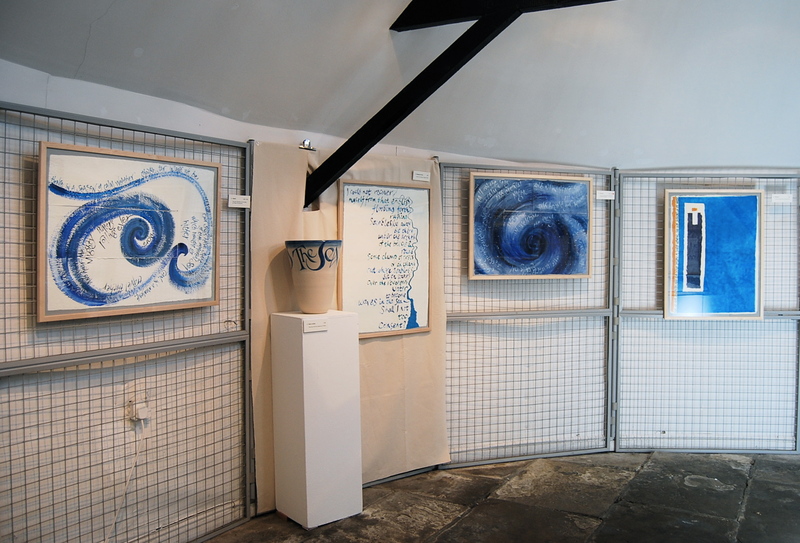 Planning the exhibition for the space has seemed to me like working within a great pot. Here, in a house of clay made for ice, beside the pond in this green space, we have an awareness of the pattern of water drawn on the world, of the sap in the trees and our bodies, the falling rain, the great river flowing through the city, the surrounding seas. Watermark looks at the patterns floating on the surface and dowses for the undercurrents. 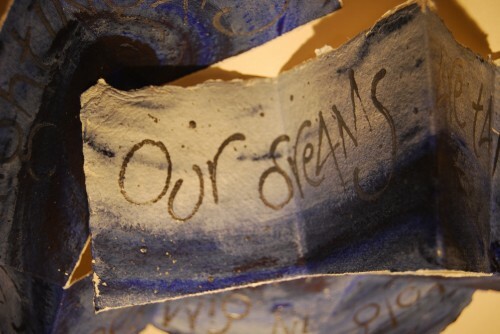 I work with clay, driftwood and handmade paper, all materials full of this water – or the marks it has left – seeking to reveal both the character of the material and the transformative process: the clay’s original wet soft malleable state and the action of the fire, or the dried paper’s light-filtering qualities and the once-wet ink’s determination. The earth/clay/body link is fundamental in my work: our place within the landscape, the elements, the seasons, time, the flow of the water. I like to examine how the light shows through. Text is of the essence. 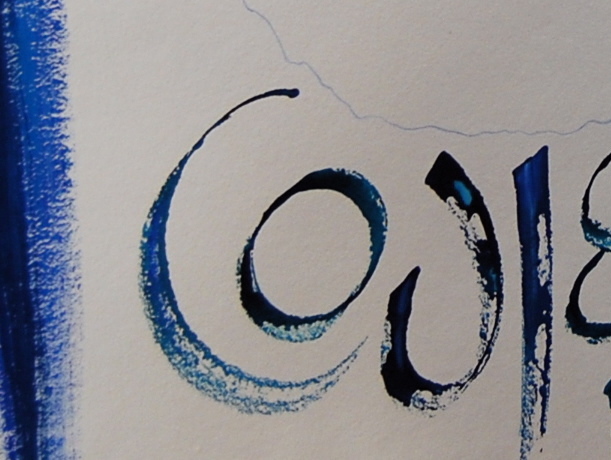 I use lettering as an architectural framework, mapping, enclosing and entering the volume contained. Marks on the surface lead the eye to the inner space – not only within the vessel form but also inside the planes of wall panels or the layers of paperworks – circling towards the heart of the matter. 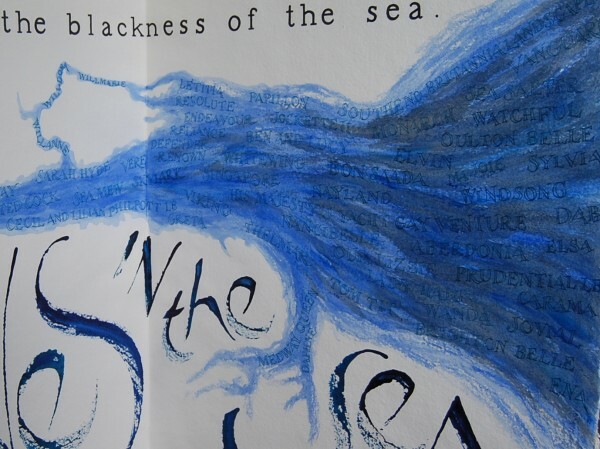 Containment, the relation between the outer surface and the inner volume, is expressed through an engagement of text and image, finding the letters in the grain, catching the words in the current, floating them on the surface of the deep. I liken this process to that of setting poetry to music, with the same implication of translation, and the same integration of words and form. 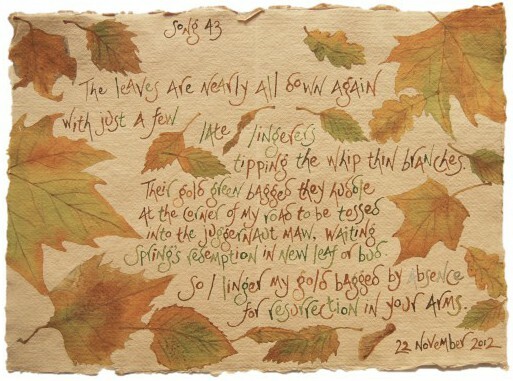 Setting a text or poem in this way gives both an immediate visual apprehension, and a slower, more contemplative reading which can lead to an enhanced awareness of the text and its relation to the form. 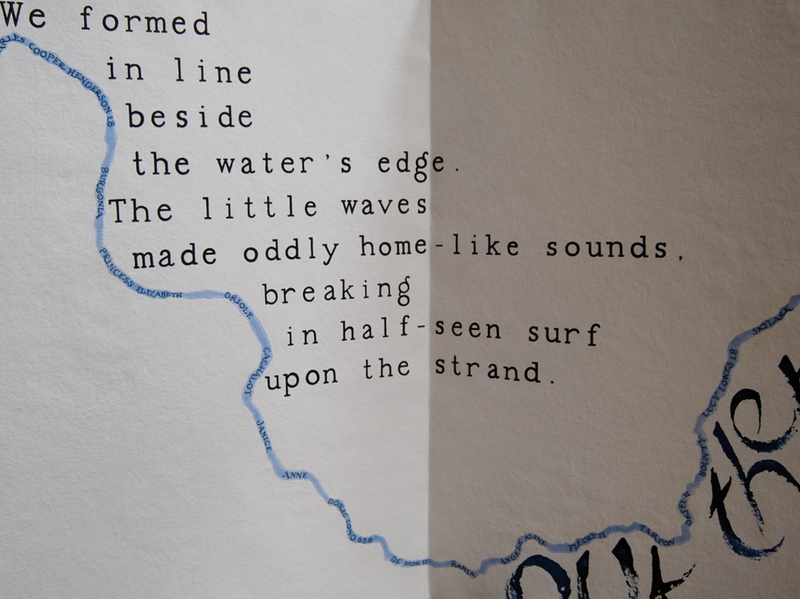 Also, for me there’s always an element of performing the text in the making process. 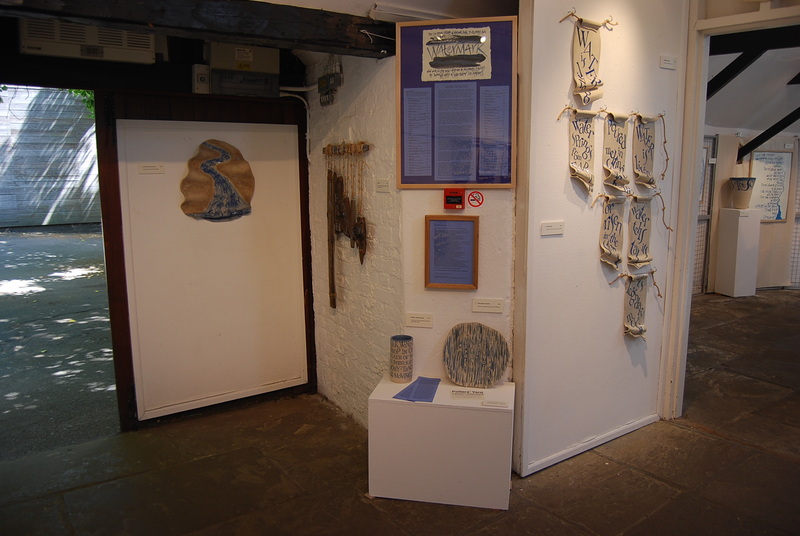 I work with white stoneware, natural found materials (such as driftwood from the Thames) and re-purposed materials (copper pipes, hemp sash-cord) with related qualities. 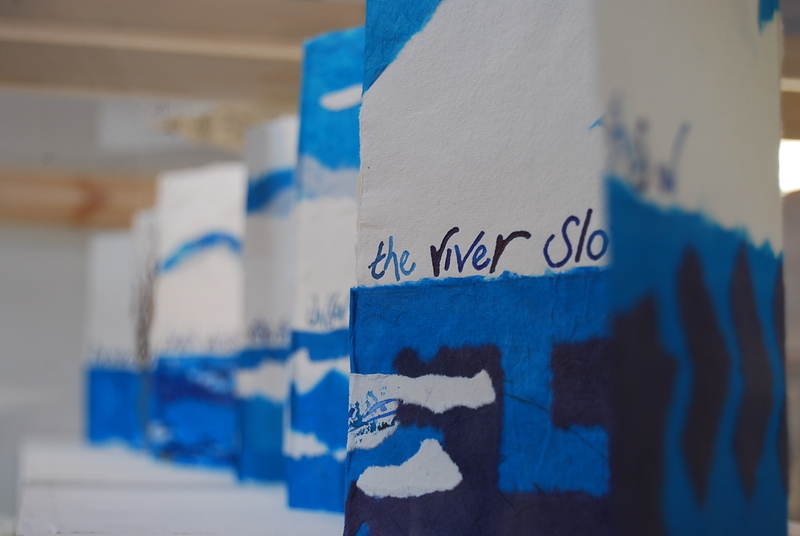 I also work with handmade recycled cotton rag paper (khadi) making artist’s books and paperworks, again with structural concerns related to my claywork, particularly in a flowing or circling sequence of pages. 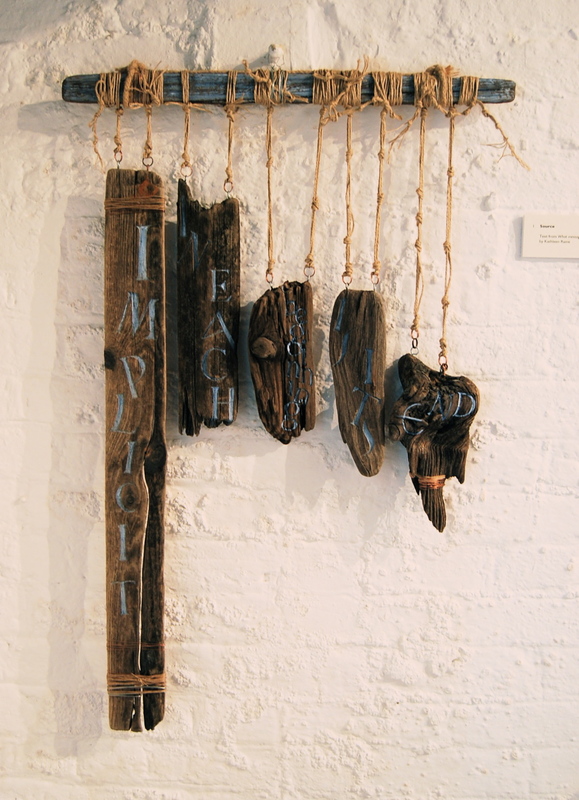 I welcome chance contributions from the process or the quirks of found materials, the changes and patina added by time, and I like themes to surface in a sequence of related works, rather than prescribe too much. 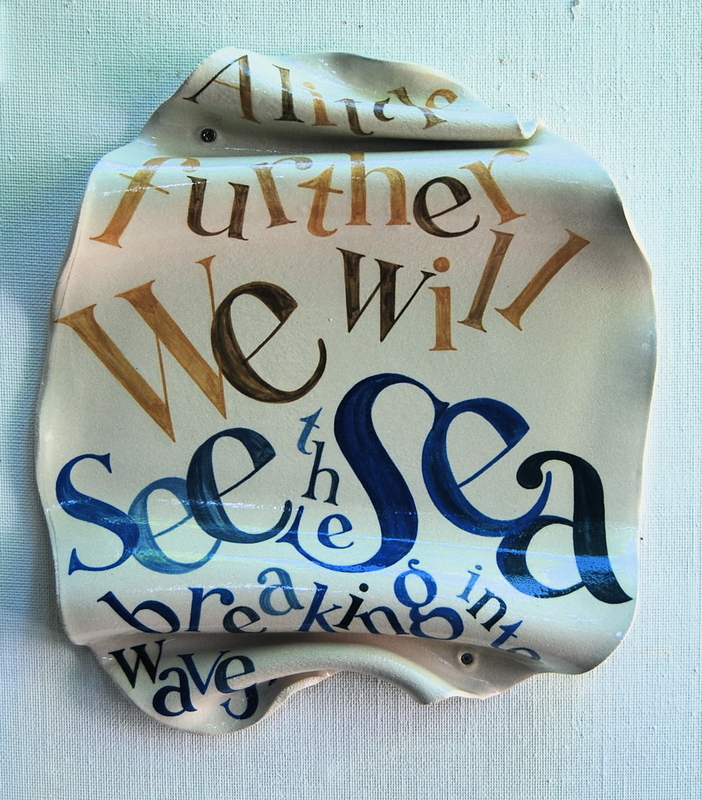 I paint freehand onto the raw dried clay with a brush, in underglaze metal oxides; then some surfaces – perhaps only inside – are glazed; on some pots I use 9ct gold lustre. 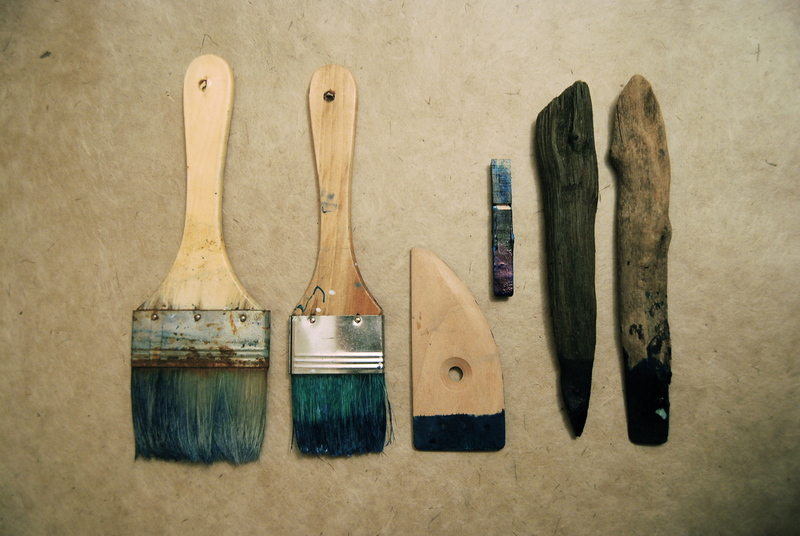 On paper I paint in watercolour, acrylics and inks, as well as natural pigments and raw materials – charcoal, beeswax, salt, sand – and I use random mark-making tools – wooden peg, clay shard, slate fragment, flint, feather, and only now and then a brush. 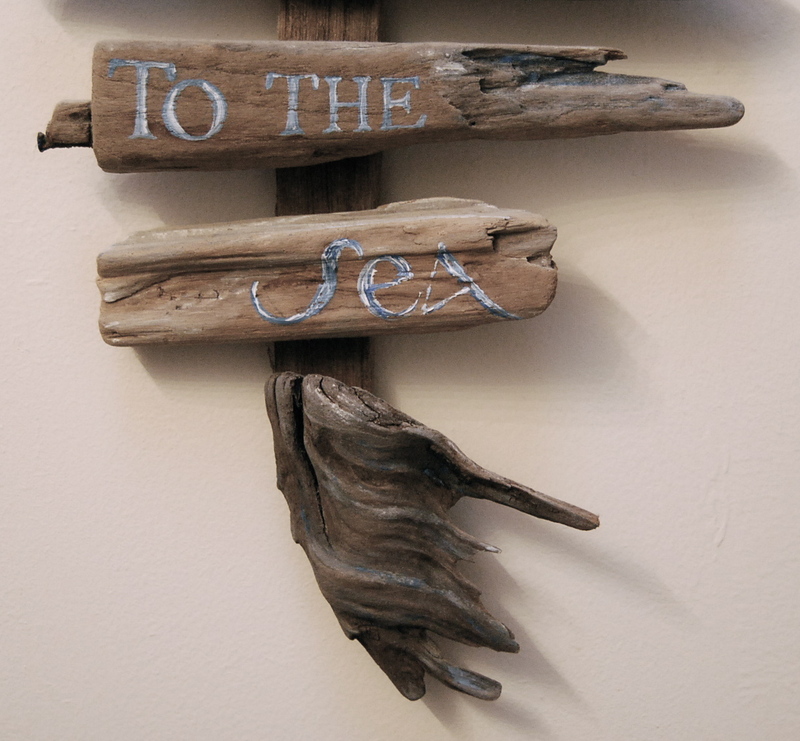 My favourite lettering pen is a small driftwood stick, picked up on the Thames beach by the Southbank. For more information about Watermark or any of my work, please leave me a note in the comments box below or click on contact details for other ways to get in touch. As always, please don’t use any of these images without permission. 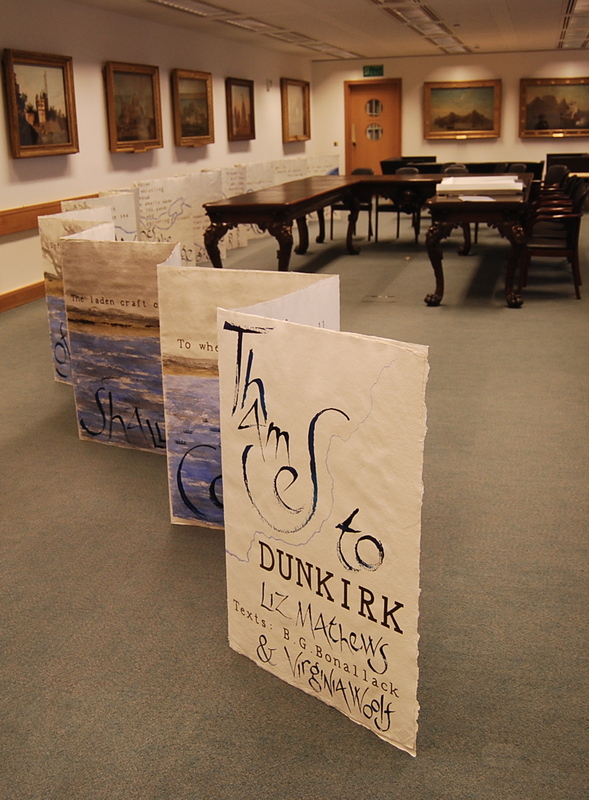 Thames to Dunkirk, my enormous bookwork, has gone to its new home (just down the road) in the British Library. When we delivered it yesterday, we were able to weigh it (over 3 stone! ), and unfold it to its full extent in one of the Library’s longest meeting rooms, to show it to curators in all its glory. 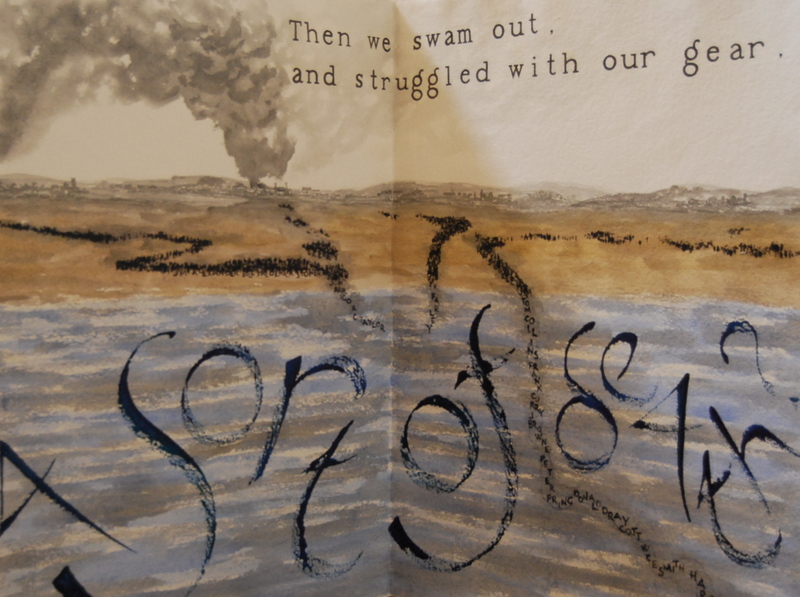 Thames to Dunkirk is a handmade book or illuminated manuscript made in 2009. It measures 1 metre high x 70 cm wide and about 10 cm deep when closed, and when fully opened to freestanding 1 metre high and up to 17 metres long. 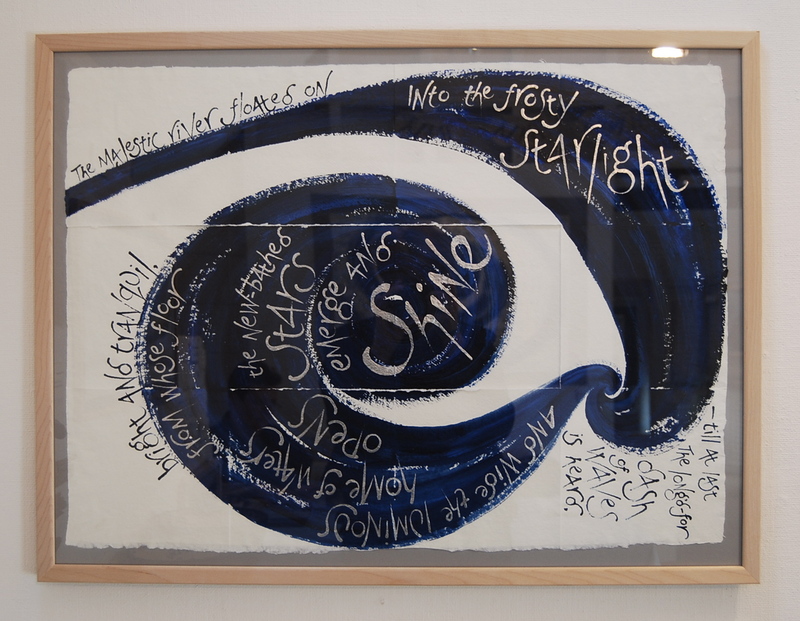 It is double sided, made with 24 individual sheets of paper, each page a sheet of handmade acid-free cotton rag paper in Atlas size (I metre x 1.4 metres), 400gsm. 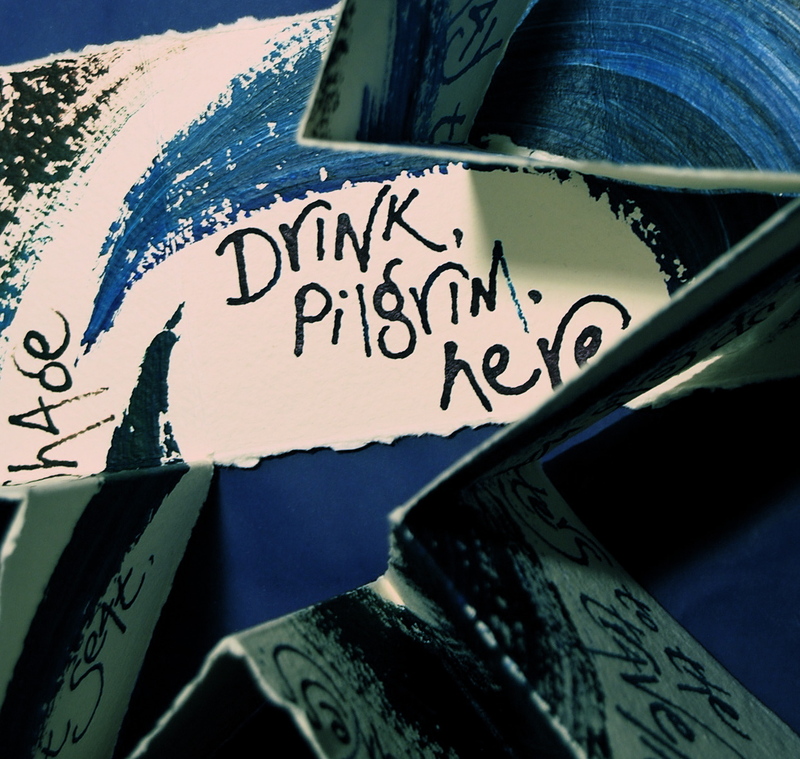 The book is constructed as a concertina, the pages fixed back to back forming alternate hinges. 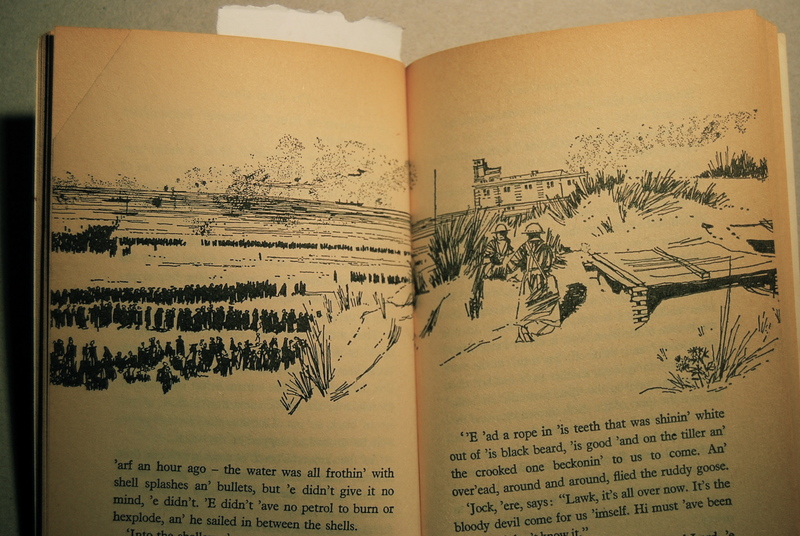 My own introduction to the Dunkirk story was in 1973 when I was 12, and my sister gave me Paul Gallico’s The Snow Goose, in an edition with Anne Linton’s line drawings. In 2008 I read in Virginia Woolf’s diary her account of that time, including the story of her neighbour Harry West’s escape from Dunkirk with several looted watches. I was struck by the enormous variety of experience within this shared event – how different it was for each of the 300,000 people there, as well as those who waited at home – a spectrum of responses from victorious exultation to rage and dissent. Through research in the Imperial War Museum archives and the National Maritime Museum, as well as published accounts, I gradually perceived ‘Dunkirk’ as a constructed myth that was both created and subverted by thousands of individual accounts – a hugely complex collective story. This sense of the scale of the event, not just in actuality but in the national psyche, led me towards the idea of constructing a surreally large book that could unfold to reveal different layers of the story. The scale of the work would reflect the disorienting enormity of the phenomenon and embody the myriad experiences that have contributed to the ‘imaginative transformation of a historic into an archetypal event’ (Kathleen Raine). 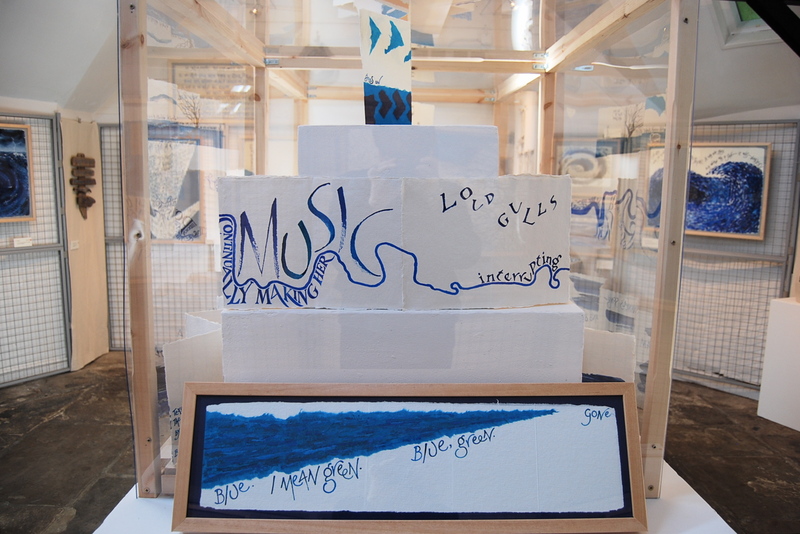 To draw these elements together, I was again inspired by Virginia Woolf, who wrote in a letter to Stephen Spender ‘I should like to write four lines at a time, describing the same feeling, as a musician does; because it always seems to me that things are going on at so many different levels simultaneously’. Four lines at once, running concurrently, to map the myth and tell all the stories in common time. 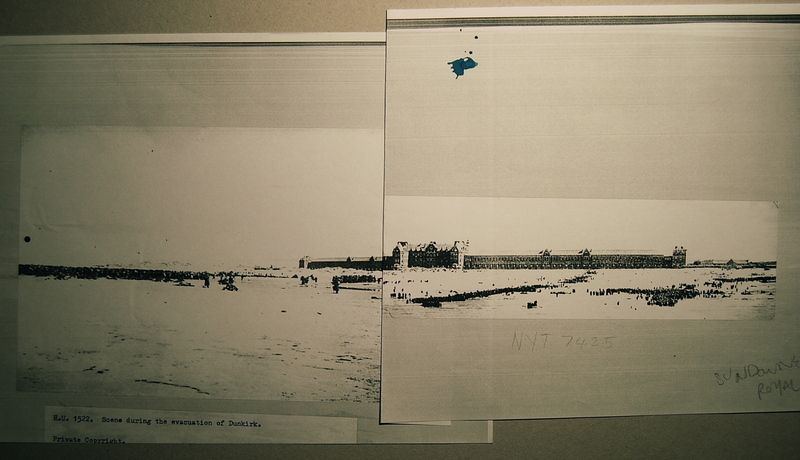 the formation of their orderly queues taken from contemporary photos and aligned with the river incised in reverse as though through the paper. the free and fluid script lettered with a pen I carved from a piece of Thames driftwood picked up on the beach in London. 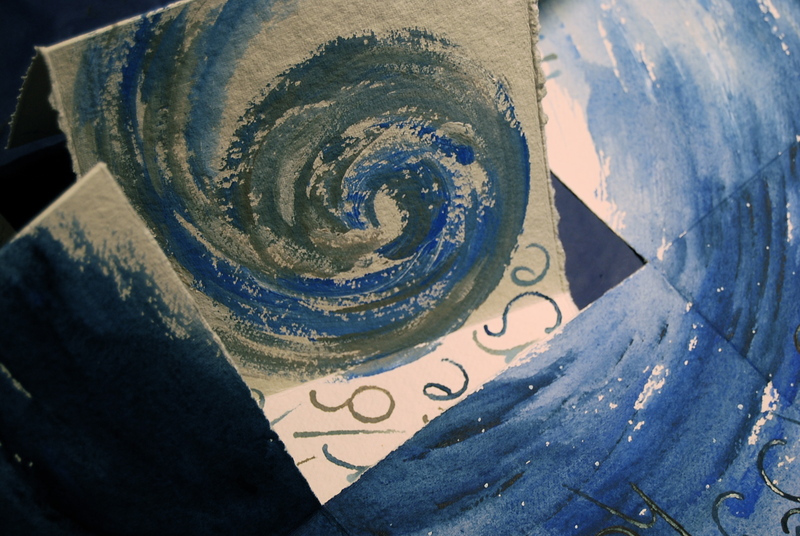 I made a first version with 24 sheets of A3 handmade paper, to design the layout of each page and establish the balance and continuity; this prototype revealed many technical issues – for example the variations of the paper’s absorbency with the different inks and watercolours, and the problems of printing between pages caused by absorbtion of the paste. Then I enlarged the design, each A3 page requiring 18 A4 grid sheets to scale up the layout to the Atlas page. 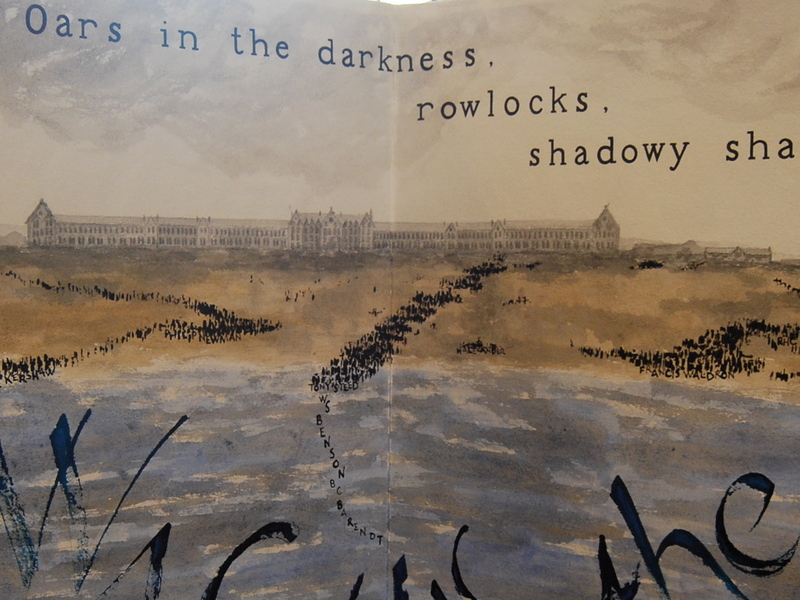 I worked on one huge page at a time, first folding the page in half, then incising the river (or its reverse, to map the composition on the Dunkirk side), then painting the watercolour river, or (later) the watercolour grisaille landscapes and the beach and sea; on both sides I had to pay particular attention to continuity of placing and colour. 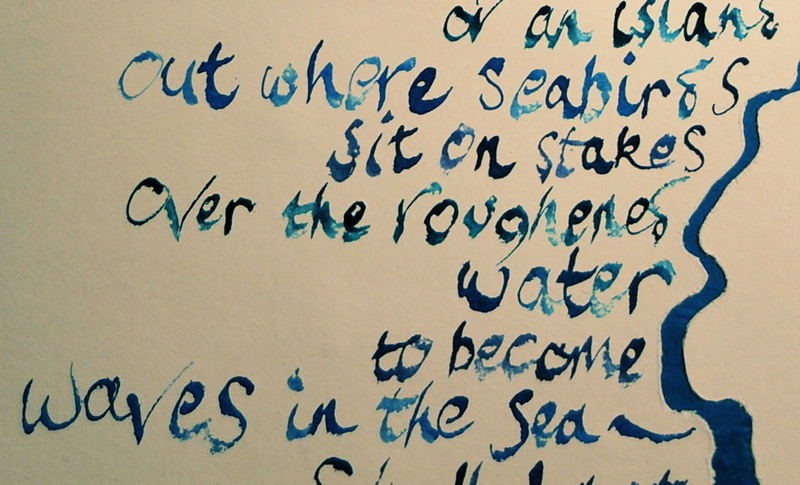 Then, when dry I sealed the watercolour painting with a clear acid-free acrylic sealant to prevent the ink bleeding, and when this was dry, next lettered the Bonallack text (upside-down, of necessity, as the paper was too large to reach across), and finally the Woolf text with the driftwood pen – the right way up. 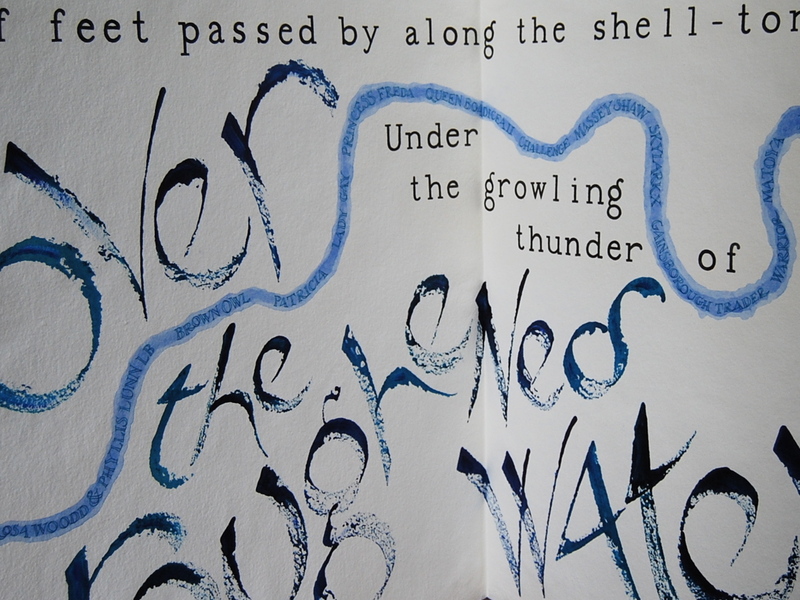 I was able to lay out the ‘type’ text in pencil first, but the Woolf text is mostly improvised. 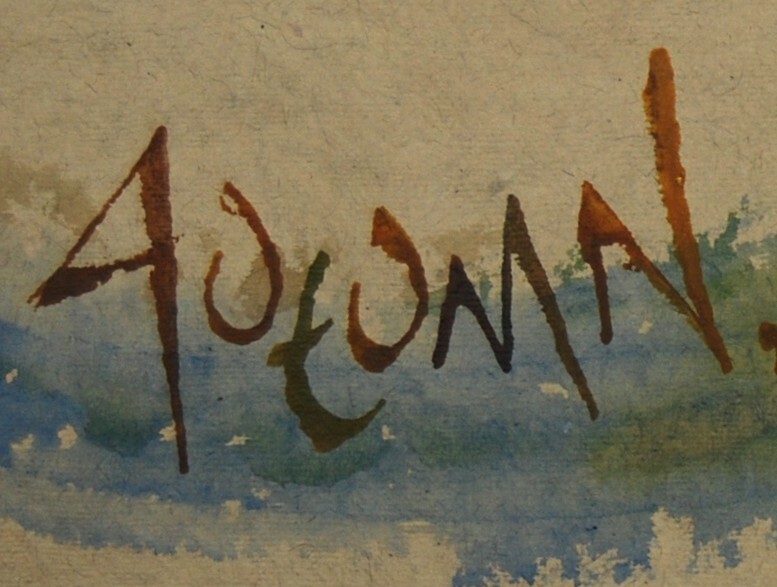 and then the front title page, with the back-to-source reverse image of the Thames. With all the pages ready, I started to construct the book (with the help of my partner), a few pages at a time to reduce the risk of the adhesive soaking through the pages, and causing the ink to bleed or print across. 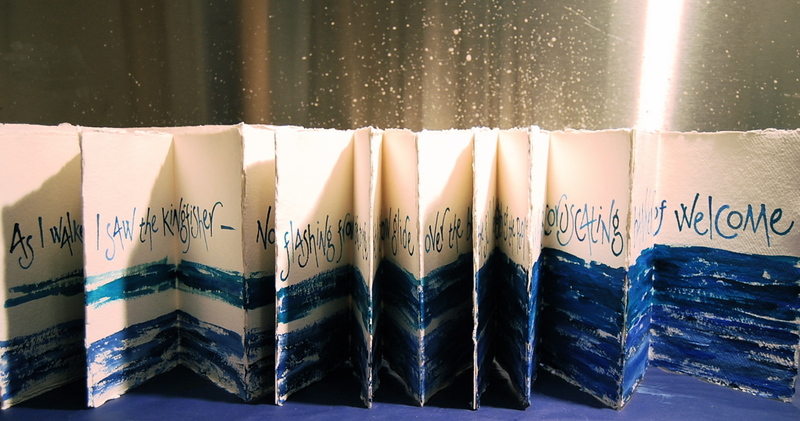 The constructed sections, and finally the completed book, were pressed in an improvised press made with two large sheets of acid-free card and our largest art-books. I then made the portfolio/case in the same press, with even larger sheets of paper (Stockwell), but these not made by hand. The Khadi Atlas handmade paper is made from 100% long fibred cotton rag, it is acid free and possibly one of biggest tub sized rag papers made anywhere in the world. Cotton rags have longer fibres than linters which are the shorter fluffy fibres of the cotton seed generally used in paper making. Genuine rag papers are rare and it is the fibre length of this raw material that gives KHADI rag papers their exceptional strength and durability. The cotton rag we use comes from T-shirt cuttings, a reliable source of pure woven cotton. Rags are pulped in a Hollander beater. Neutral pH internal size (glue) is added at this stage. KHADI rag papers are the only handmade papers in India made with neutral pH size and so they are the only ones that are genuinely acid free. 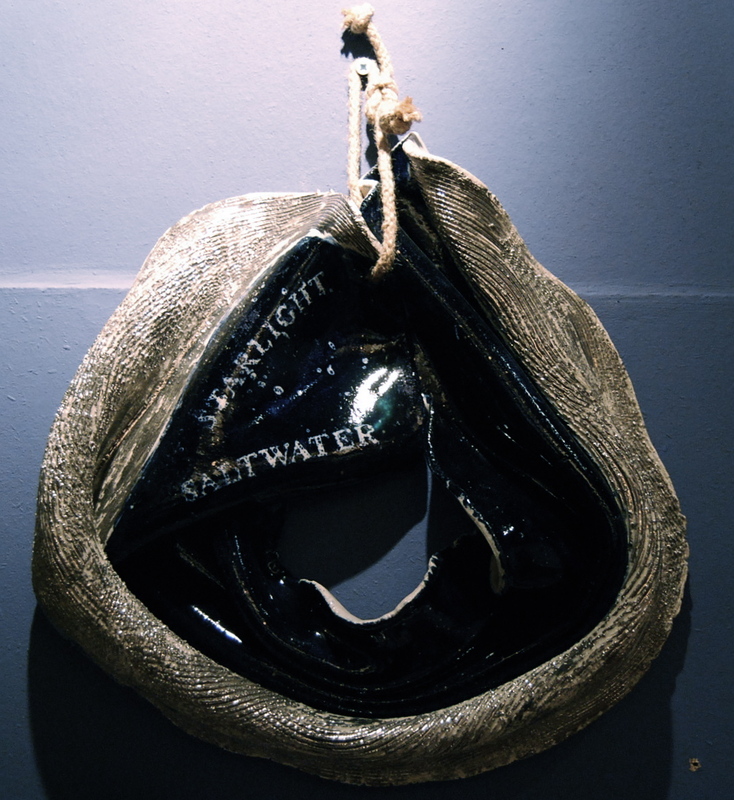 The sheet is formed on the mould in a vat of water. The process involves a very small amount of fibre and a lot of water. The fibre is retained on the surface of the mould while the water drains through the mesh. The characteristic deckle edges of the sheet of paper come from the slippage of pulp between the deckle and mould. The mould is lifted from the vat and the sheet is laid or couched onto a woollen felt. Another felt is placed on top and the process is repeated. When a pile of sheets interleaved with felts has been made they are pressed in a hydraulic press to remove excess water. Papers are loft dried. After drying, sheets are tub sized (surface sized) with gelatine. The mill, KHADI PAPERS INDIA, now directly employs over 50 men and women from local villages and indirectly provides work for bookbinders, printers, envelope makers and the carpenter, Irrappa, who makes our moulds and deckles. We now have our own organic farm, irrigated by run-off water from the paper mill. Here we grow mangoes, bananas and organic vegetables. 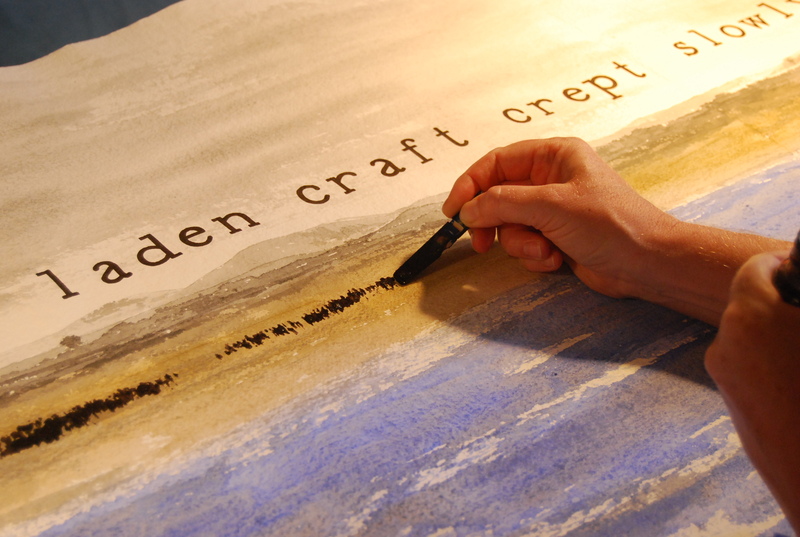 Other materials used in the making of the book include Shepherds conservation adhesive (neutral pH), Winsor & Newton watercolours, acrylic inks and sealant, and an elderly bottle of Quink from c.1950’s. 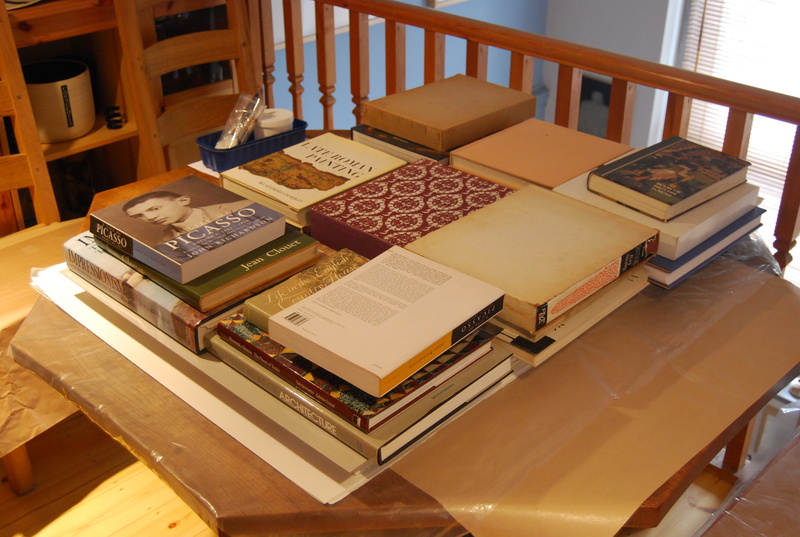 Materials used in the slipcase were acid-free machine-made Stockwell paper covering acid-free board, with conservation adhesive and linen reinforcements and tape. 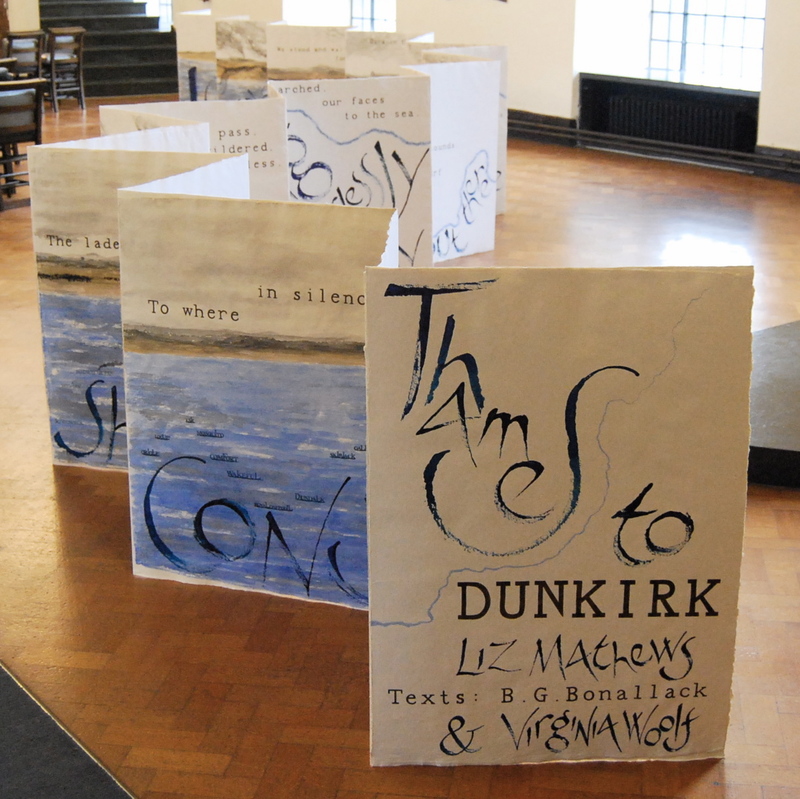 Thames to Dunkirk was made in the context of a group of related works called Watermark, each work relating text to form and image, and using specific material qualities in a process of building-up or layering. 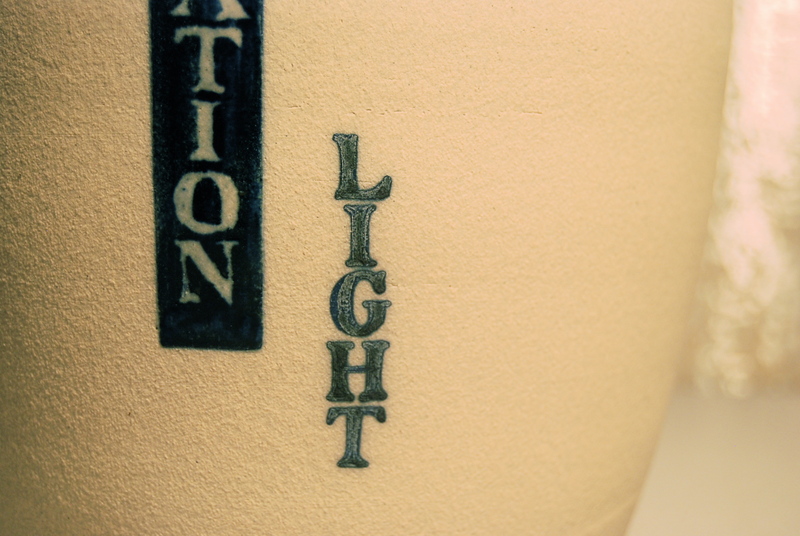 I like to work on the edge of where text and form and image meet, to see how the light shows through. 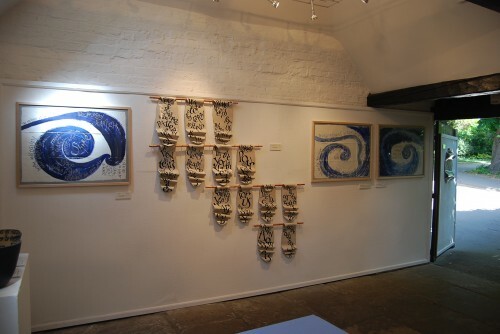 I work in clay (throwing on the wheel or handbuilding), driftwood from the Thames (in constructions of pages like banners and panels), and handmade papers, examining the materials’ closely related qualities and formal references. 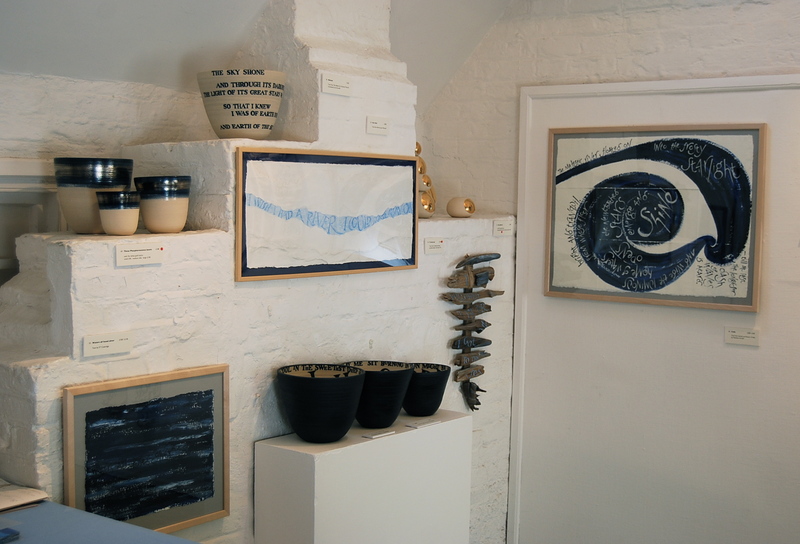 As well as watercolour and oxides, I use natural pigments and raw materials – charcoal, beeswax, salt, sand, driftwood, linen, ink – and I use improvised mark-making tools – wooden peg, clay shard, slate fragment, flint, feather, scrap of driftwood. 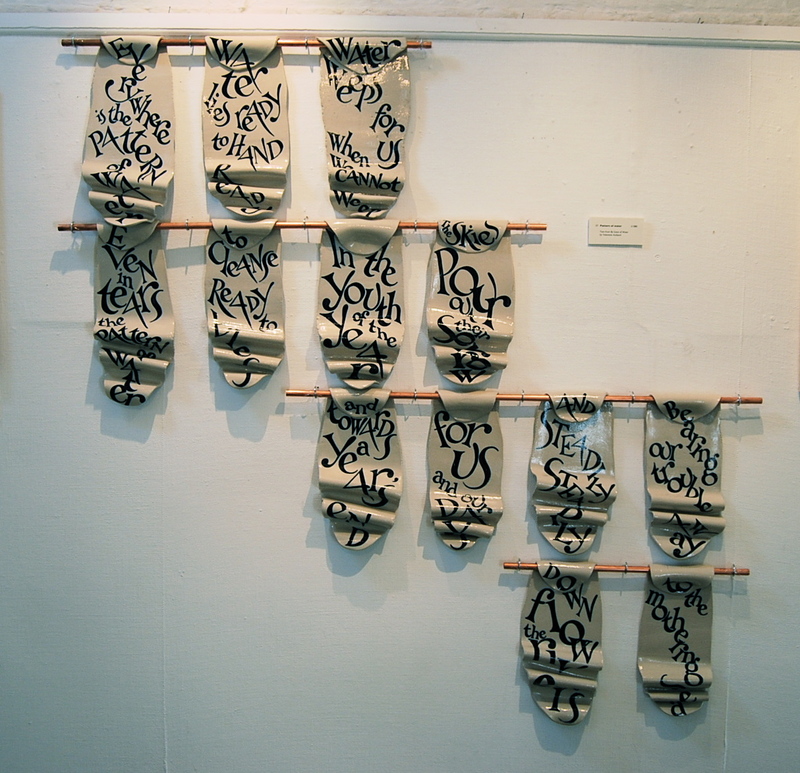 I use lettering as a topographical framework for design, both mapping device and entry to the volume enclosed. The marks on the surface allow the eye to read the form and content of the inner space, not only within the vessel but also metaphorically within the planes of wall panels or the layered light-bearing textures of paperworks. I liken this process to that of setting poetry to music, with the same implication of translation and reinterpretation, and the same kind of engagement of text to form; there is also an element of performing the text. Thames to Dunkirk is on show in the British Library’s exhibition for 2012, Writing Britain: Wastelands to Wonderlands, from 11th May to 25th September 2012. For the last year I’ve been completely engaged with the largest single work I’ve ever made. 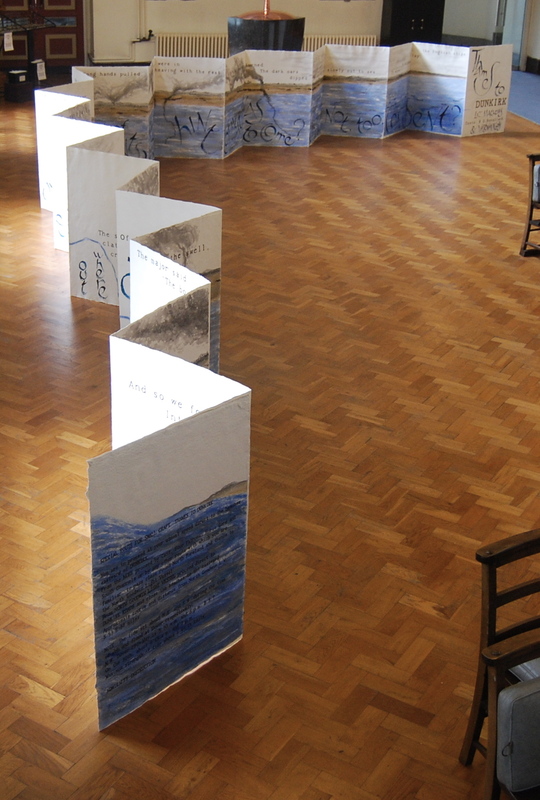 It’s a freestanding paper sculpture, 1 metre high and about 17 metres long, constructed in the form of a huge concertina book. It’s called Thames to Dunkirk. This May 2010 sees the 70th anniversary of the evacuation of the British Expeditionary Force from the beaches of Dunkirk in 1940. 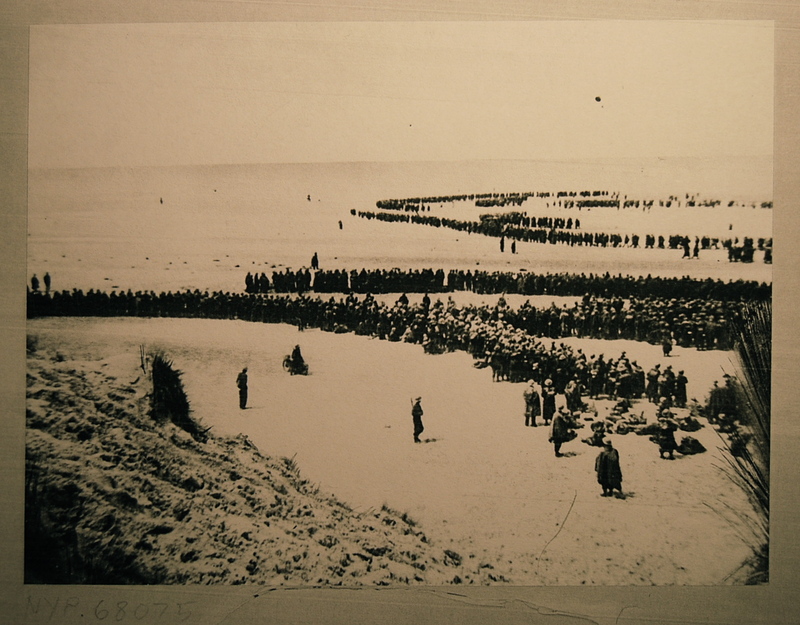 In the course of my research when making Thames to Dunkirk I was struck by how extraordinarily different each person’s account was of an event shared by hundreds of thousands of people, the sheer variety of experience within such a momentous shared event, and the far-reaching effects of conflict on the individual. 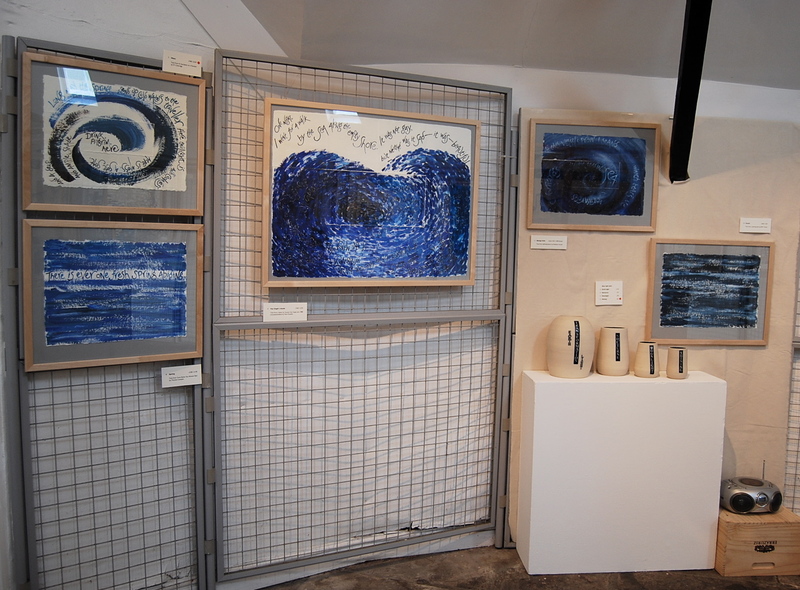 Through fragments of stories, my work explores the forces of compulsion and power, the tensions between individuality and duty that led to this sea’s edge extremity. The book, opened out, reflects in its size something of the surreal scale of the event, and altogether subverts the concept of ‘book’ – something familiar, useful, dependable, portable – into something altogether unfamiliar and difficult to handle, which you have to walk all the way round to read. 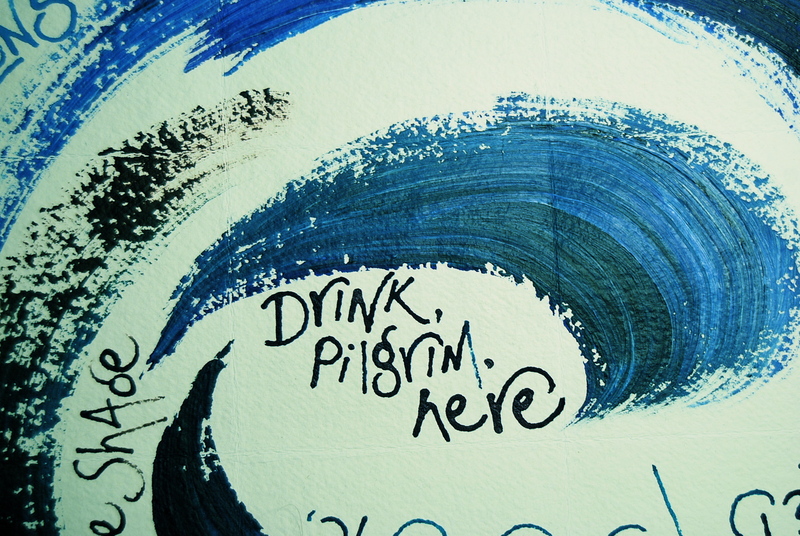 It also reflects some of the tensions between individuality and communal responsibility that we’ve seen so much of recently – how we can be swept away on rivers not of our own choosing, into conflict or State-determined disaster, or indeed sold down the river by the powers that rule our lives. 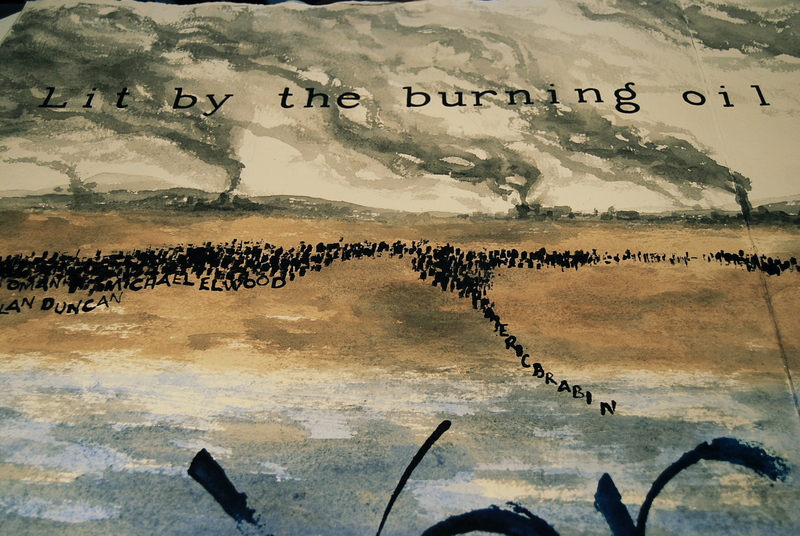 During the time I was making this work (July 2009) 94 soldiers died in Afghanistan; the contemporary relevance is evident without overstatement. 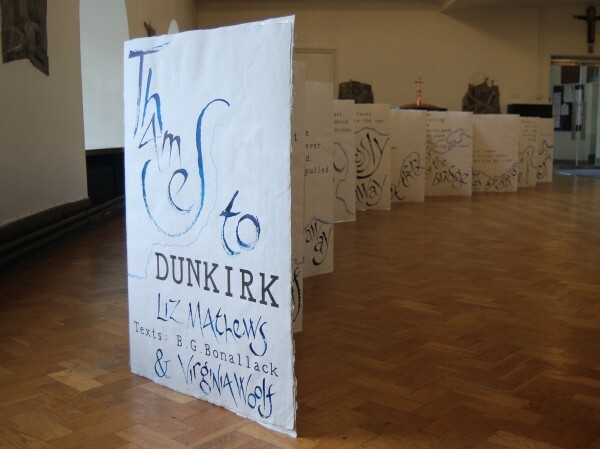 Thames to Dunkirk is now part of a major online interactive installation, which I hope will give some new insights into the lasting legacy of one of our most potent legendary events. 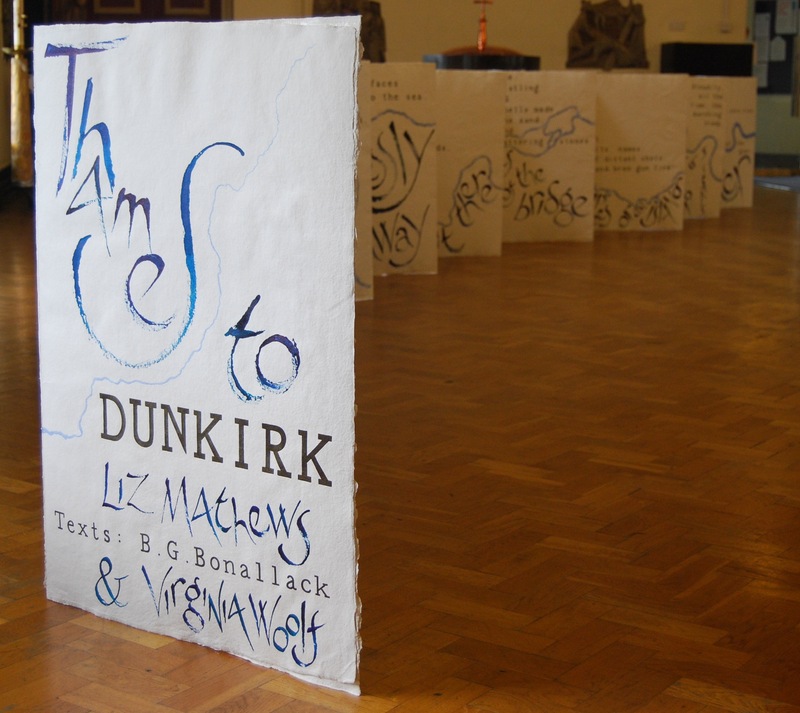 The Dunkirk Project is online now, the story will be unfolding daily during the nine days of the anniversary, and I hope you’ll want to contribute to the collective story. 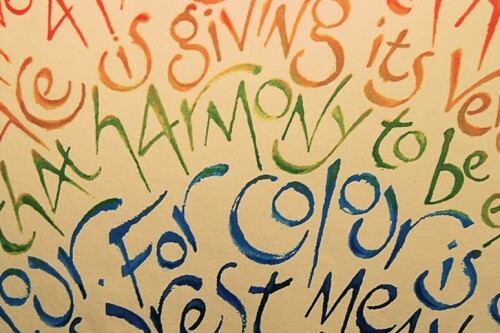 One of the things I return to again and again in my work is a process of connecting small individual elements into a larger entity, the separate parts woven together and unified by the flow of words in the text, like the pages of a book. 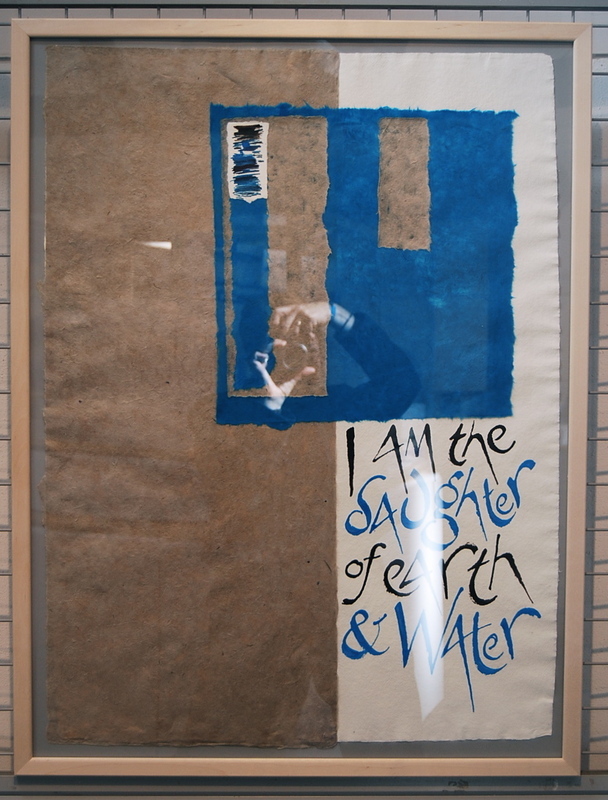 In the Southbank Centre’s Poetry Library I was given an exciting opportunity to work with the space itself, and to articulate a response to the architectural and conceptual nature of the space. 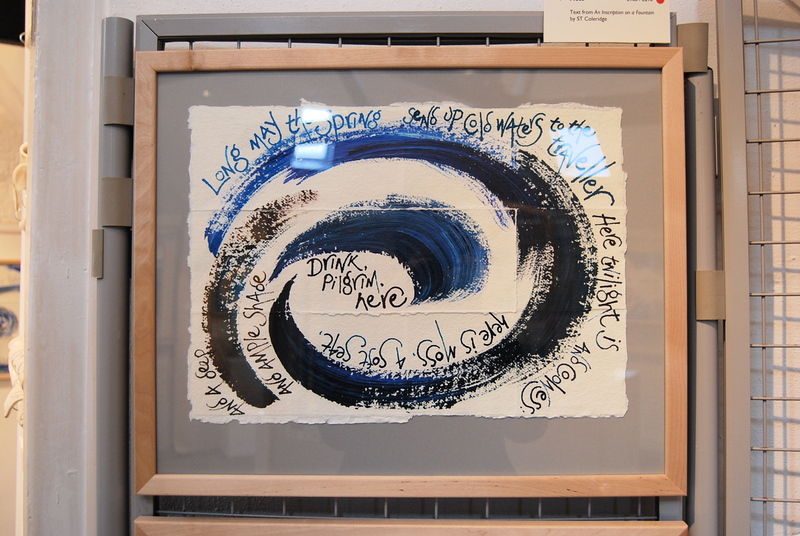 I wanted my work to penetrate the library, not just to hang about in the exhibition area. 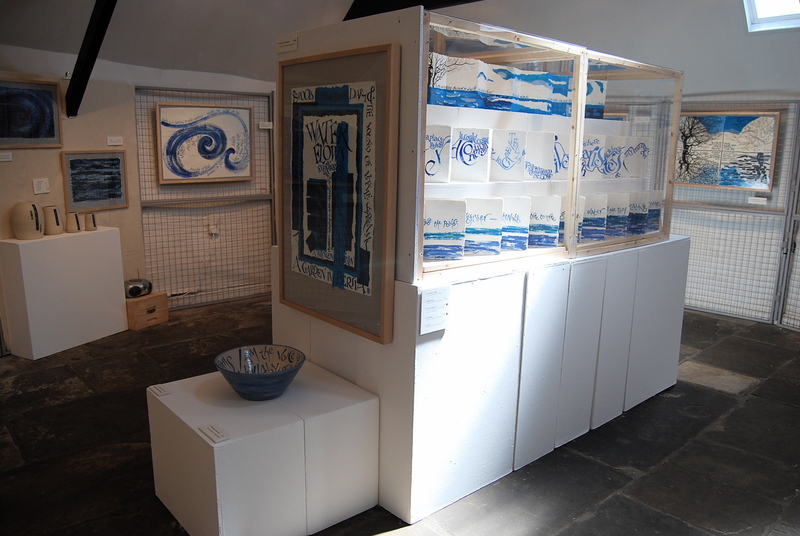 One of the ways I approached this was to treat certain parts of the space like a big pot, the pillars for example, or the glass lift, or one of the aisles between the bookstacks, and examine how I would respond to that shape and the space contained in a pot I was making. Here, of course enters the problem of scale. 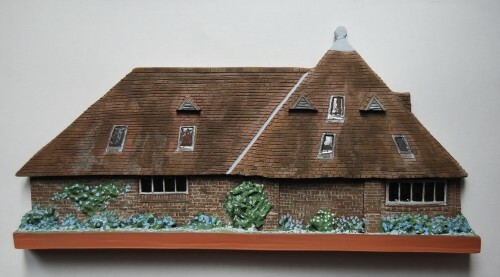 Working in clay obviously imposes some limitations of size – my kiln’s capacity is about 7 cubic feet, which seems to take up quite a lot of room in my London studio, but isn’t huge for a kiln. The shelves are about 19″ square, so the largest individual things I can make are either panels that will fit on one shelf, or pots that fit into the vessel of the kiln space without shelves. These objects are large, but won’t cover a wall. One solution to the size limitation is the ancient art of tiling or mosaic or brickwork – making a large thing from small elements which can interlock or overlap or connect in layers. And the best way I’ve found to make this connection, to interlock the elements, is to allow a text to flow across the sections, to make each tile a word, so that the work is ‘read’ as a whole individual object, just as the brick wall becomes something more than the sum of its parts, or the book unites its pages to an entity. 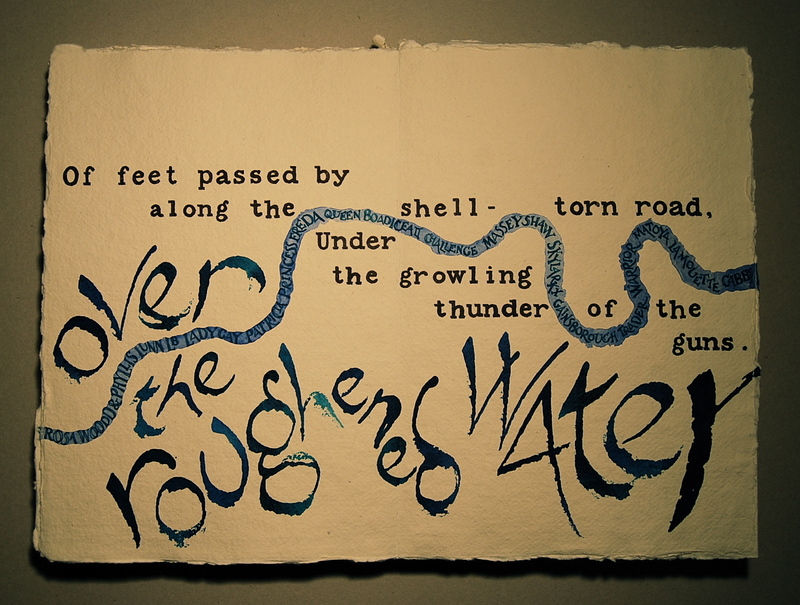 The text is from Valentine Ackland’s poem By Grace of Water. 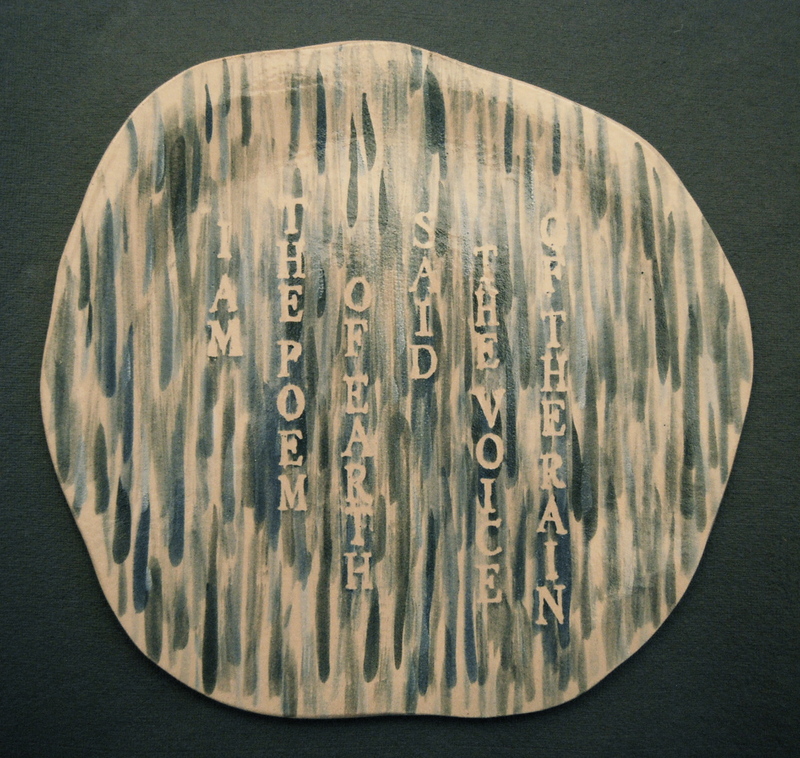 Here it’s important that the wetness of the raw clay should be present in the fired work, and I’ve aimed for this with the folding of the clay and the physical placing of the letters, setting them like leaves floating and spinning downstream, linking the panels into a whole with the flow of words. 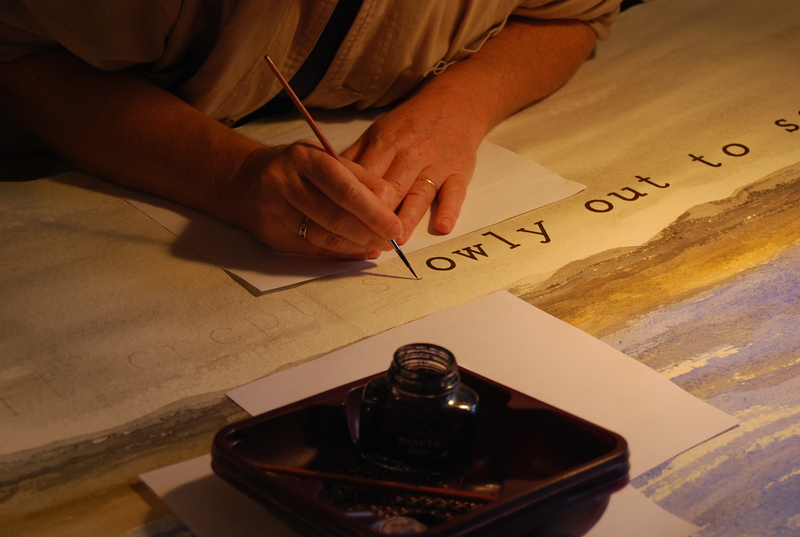 The letters were set first with pencil on the dried but still raw clay, then the oxide was painted on with a brush (some areas in the hollows being quite difficult to reach) and then the panels were fired on sand quite slowly to allow for movement and shrinkage in the clay. Then I glazed them, to add to the watery effect, and this needed to be carefully controlled at top temperature to prevent the colour bleeding into the molten glaze. The panels are hung from copper pipes and cuphooks. 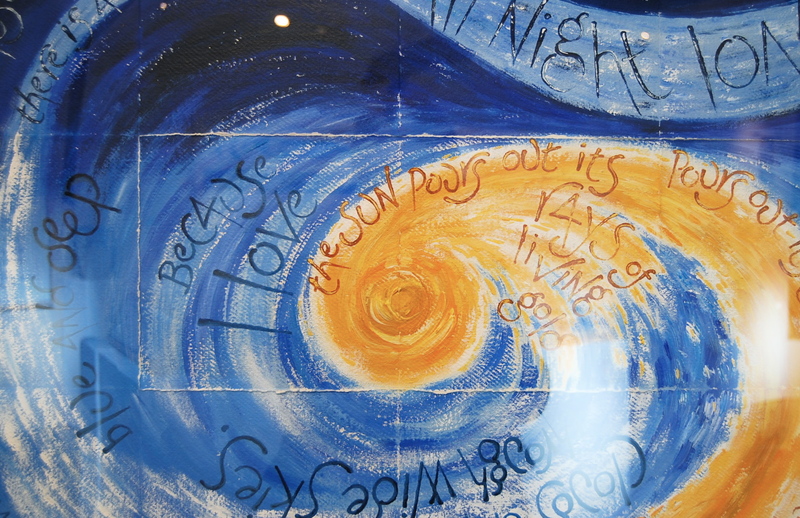 Another stimulating problem was the two great pillars bang in the middle of the exhibition space in the Poetry Library. Hard to ignore, these huge pillars run right through the building, down to the earth below, rooting and supporting the whole edifice. 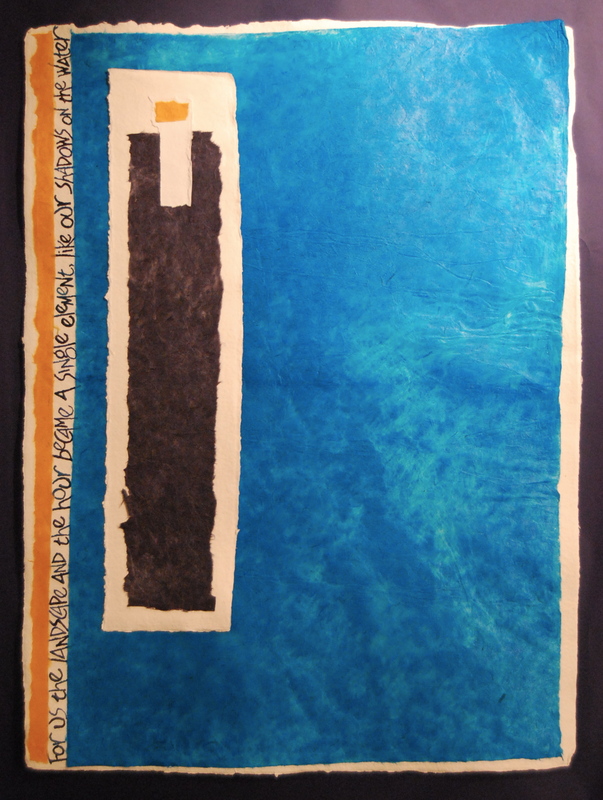 I wanted to reflect this sense of solidity, and the cathedral-like effect, with a text that would clothe the pillar like vestments, wrap it in prayer flags, but I also wanted something that would convey a sense of spiritual lightness to balance the gravity. 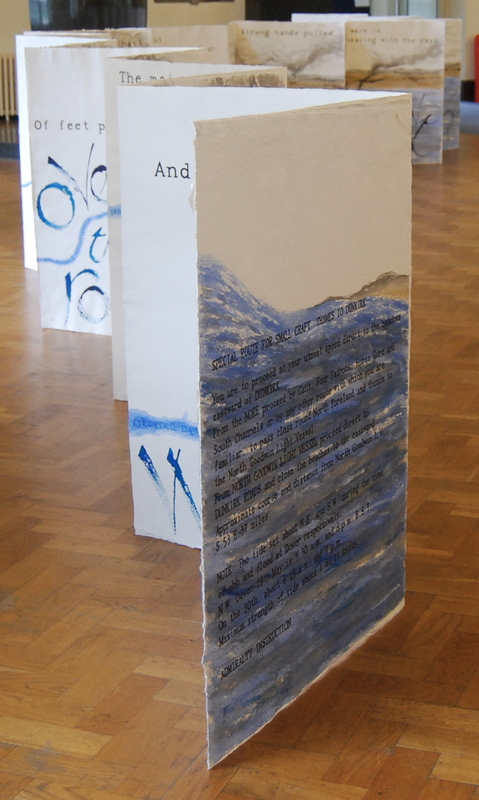 The poem begins with a rising wind, and I used thin paperclay flags to wrap the pillar in a banner that waves and flaps and streams in that wind. 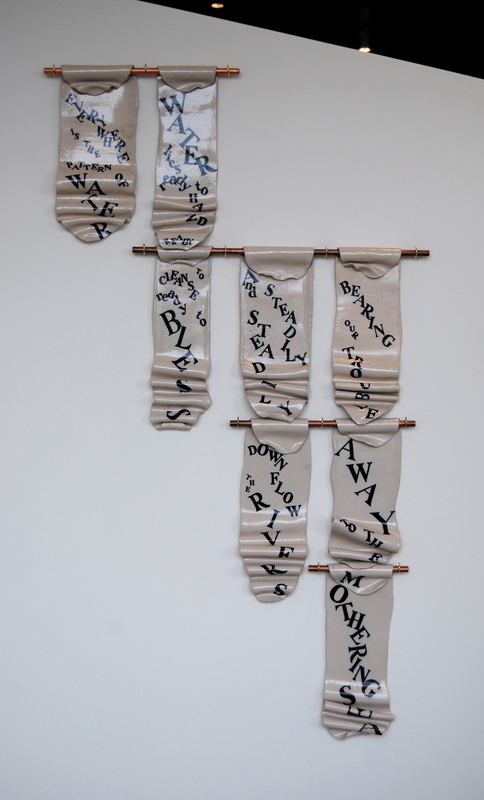 The physical lightness of the paperclay flags allows them to be hung with embroidery silks tied round the pillar, using the same colours as the lettering, and referencing both the domestic and the sacramental. 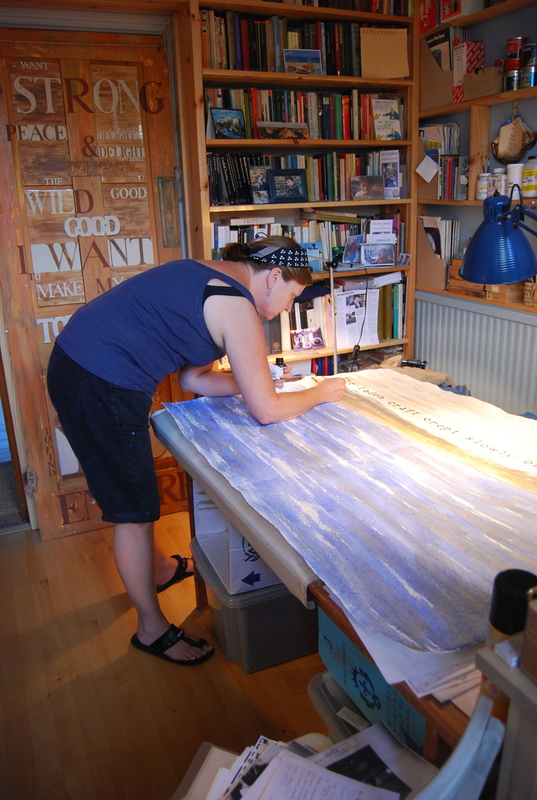 With this banner, the installation was part of the making process; I don’t have room in my studio even to lay out a work as large as this to see if it will fit, so I installed with my fingers crossed. Luckily the form is very flexible, so I was able to adjust it to fit the pillar’s requirements, and in the process I realised that it would work just as well on a flat or curved wall as on the pillar. Our days and deaths and births within its sheltering folds. 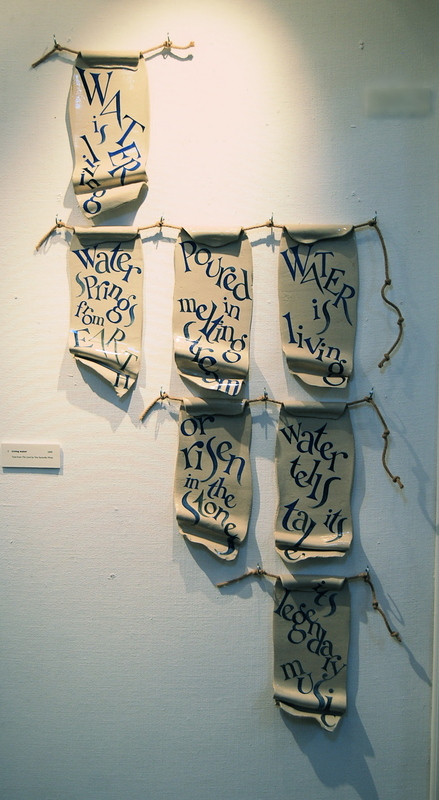 (Most of this text is taken from Working with words, a series of gallery talks given in the Southbank Centre in 2008. 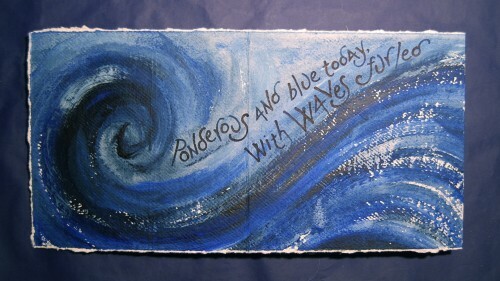 The full text can be read in my artist’s book, Journey from Winter, in the Poetry Library’s rare book collection.) 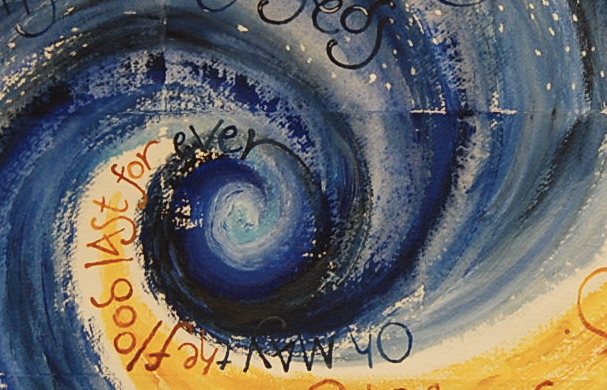 For some more banners, please have a look at the Banners page. 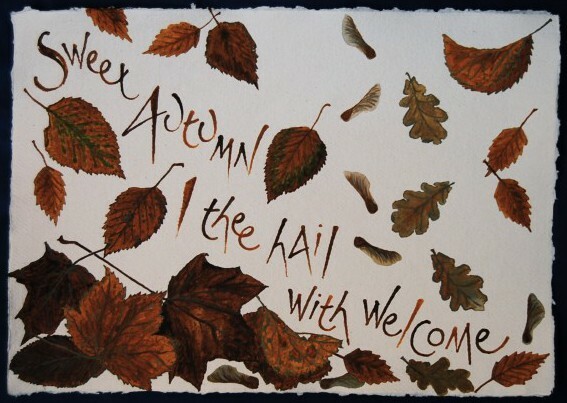 To buy or enquire about any work, please leave me a note in the comments box below, or click on contact details. 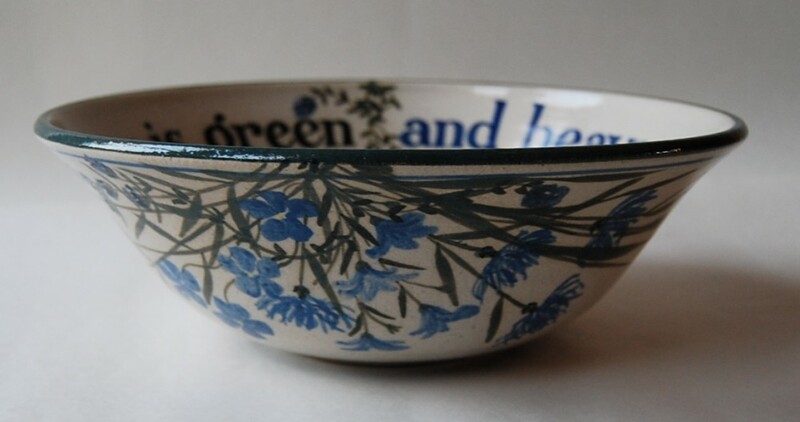 Spencer’s encouraging observation is lettered in green and blue round the flared rim of Green Earth, an open shallow bowl of a good size for fruit or salad, as well as a cheering thing to look at and handle. The flowers are flax, thyme, periwinkles, lavender and cornflowers, with some blue-eyed grass – a foretaste of the joys to come. 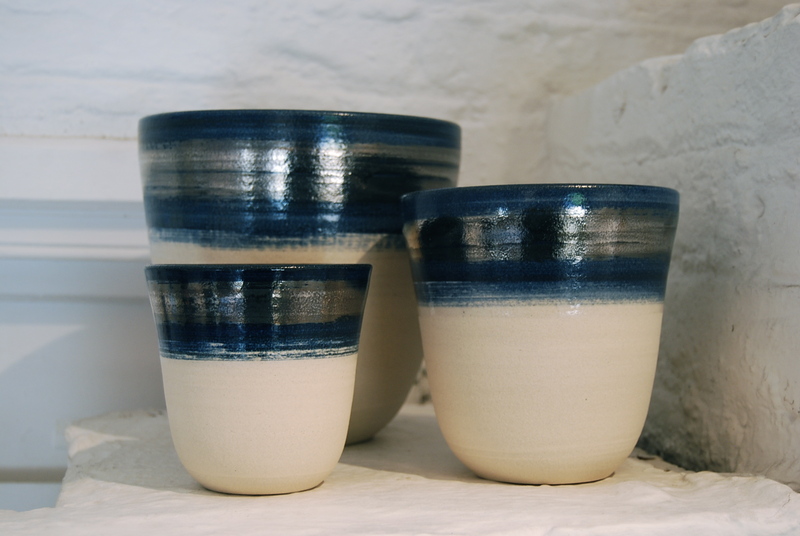 I very much enjoy making seasonal pots, responding to the turning year. 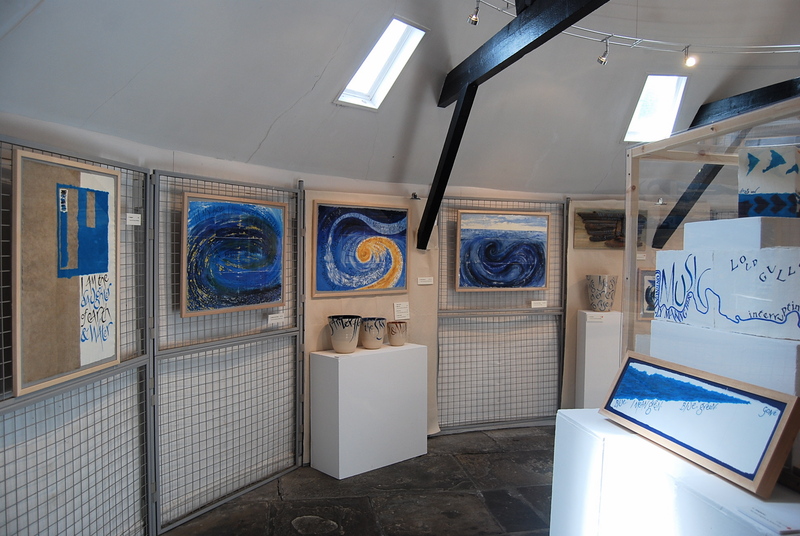 For some other Spring pots please see the Meadow page, and for some snowy works have a look at the Paperworks page. I’ll be featuring Summer, Autumn and Winter pots later in the year, including some special pots for Christmas. 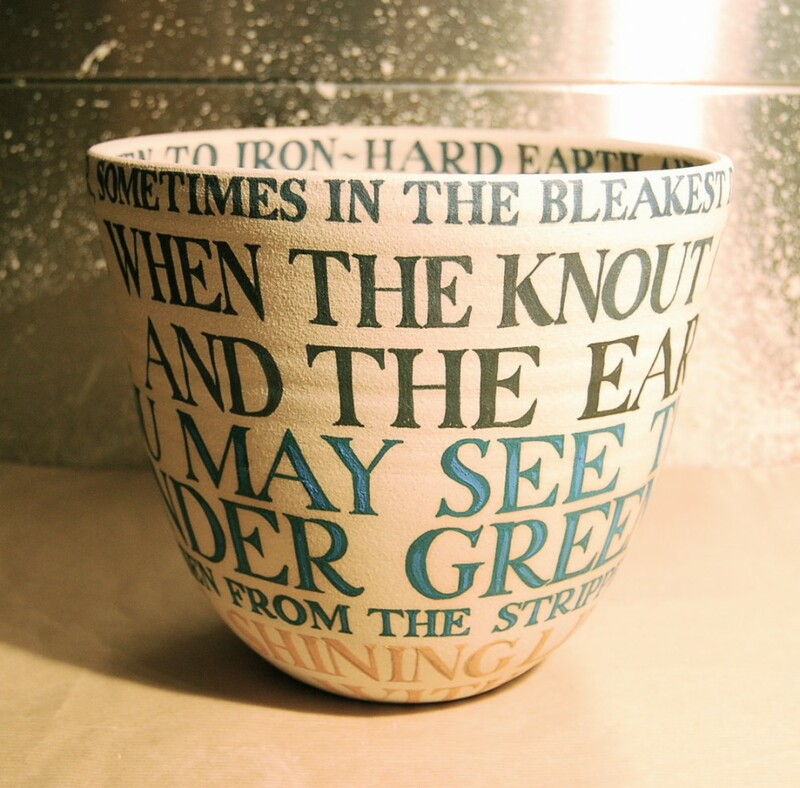 The Green Earth bowl is thrown on the wheel in white stoneware clay, lettered and decorated by hand with brushwork in underglaze colours, fired, glazed with a clear glaze and then fired again. It’s 27cm across the rim, and 9cm high. Signed one-off, for sale £120. To buy or enquire about this or any work, please leave me a note in the comments box below or click on contact details. All photos copyright Liz Mathews. Permission is needed for any use of these images. 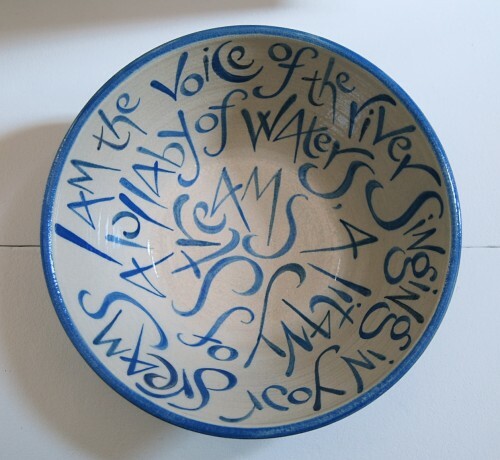 The lettering on this tall bowl is set so that it maps the physical contours of the bowl for the eye to understand, with colours that reflect what’s happening in the text, and with the lettering responding to the curve of the vessel and the physical implications of the text. 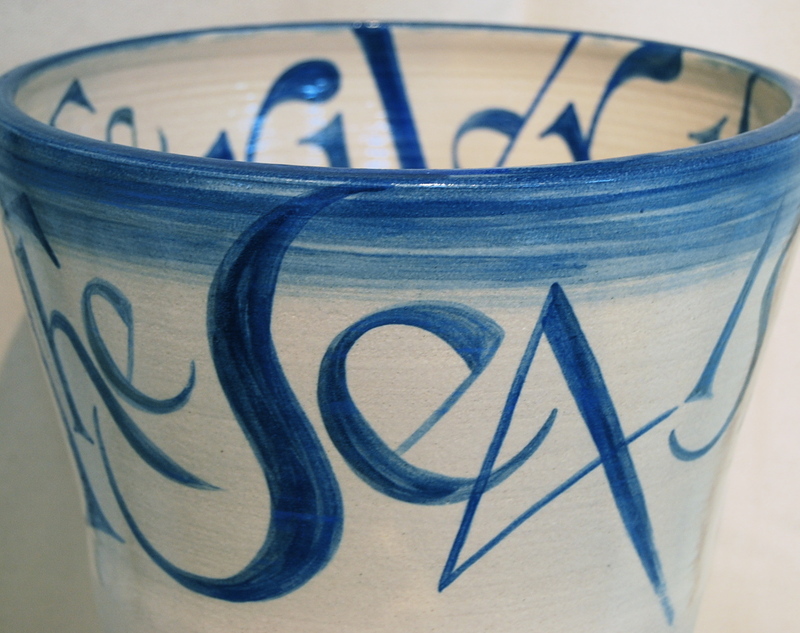 The lettering is applied with a brush, and then fired into the body of the clay, in this case without a covering clear glaze, to allow the earthy texture of the unglazed clay to surface. 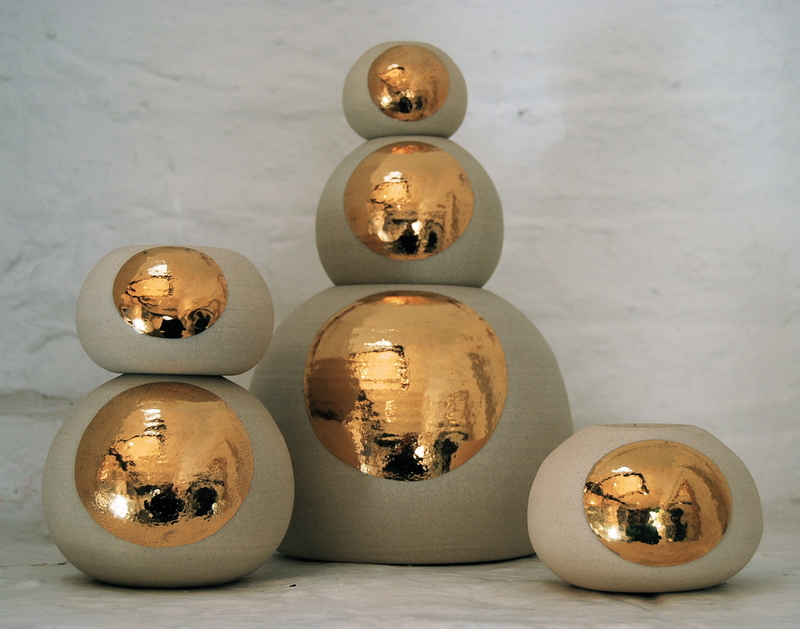 This articulation of form allows a tactile apprehension of the pot’s dimensions, its enclosing of space, expressing the individuality of each vessel I throw on the wheel. 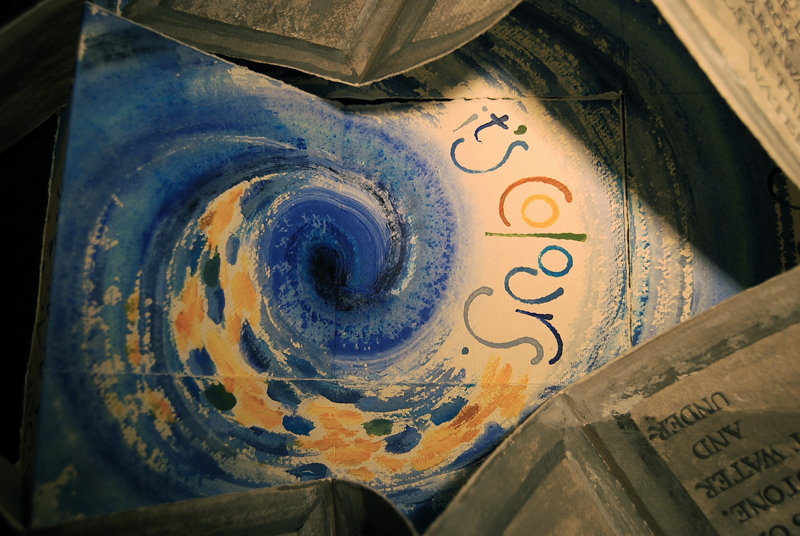 The sense of a space made with words is then extended by the setting of the words to reveal their meaning. 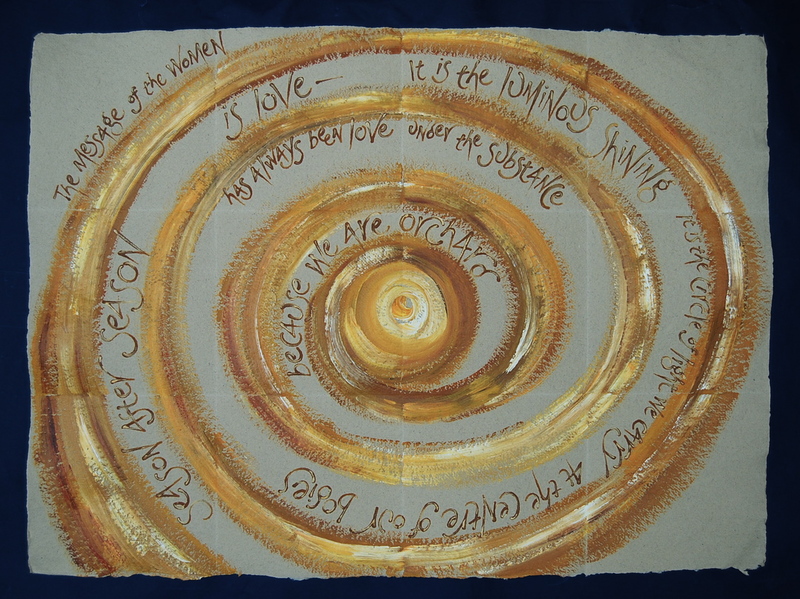 Here the text is from a poem by Valentine Ackland called Hope of Poetry, where she presents her belief in the future and her faith in poetry as a physical thing, vulnerable like a tender little green plant, but strong and unquenchable like a flame. 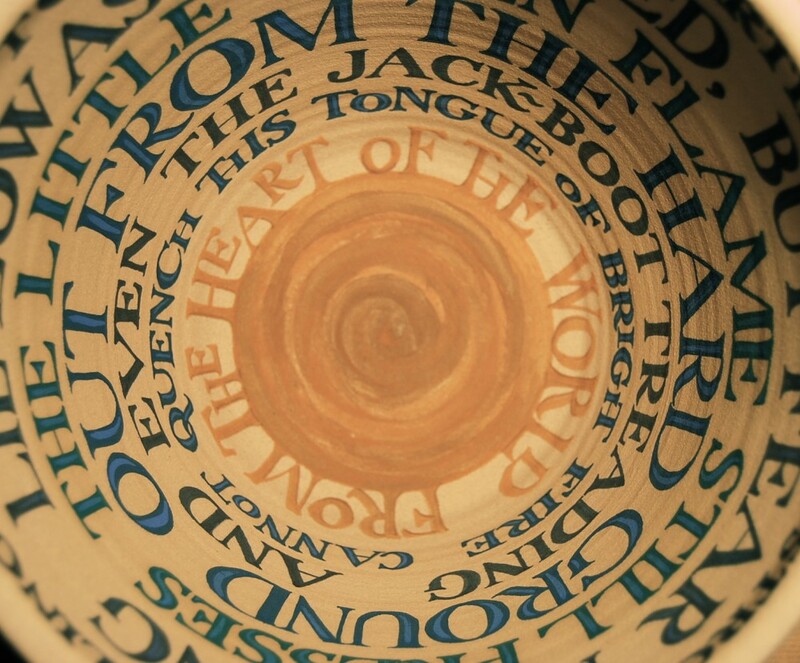 I’ve set the text around the earthspace of the clay vessel, mapping the contour with concentric rings of colour that reflect the text, and using these bands of coloured text to make the bowl appear almost see-through, to draw the eye inward. 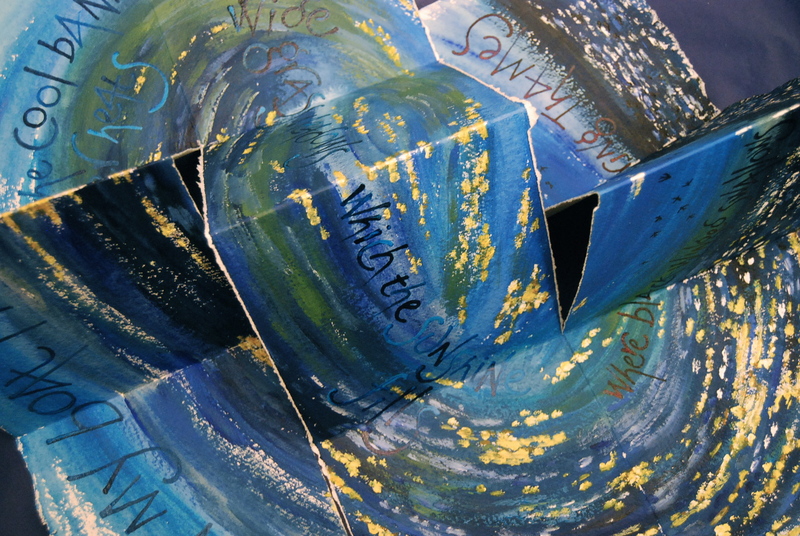 And I’ve used the parallels and tensions in the text to mirror the outer and inner surfaces of the vessel, to allow the viewer to apprehend the relationship between without and within, and between text and form, and to see through to the core of bright fire at the heart of both. Signed one-off. 19cm high x 19cm at rim. To buy or enquire about any work, please leave me a note in the comments box below or click on contact details. All photos copyright Liz Mathews. Permission is needed for any use of these images. 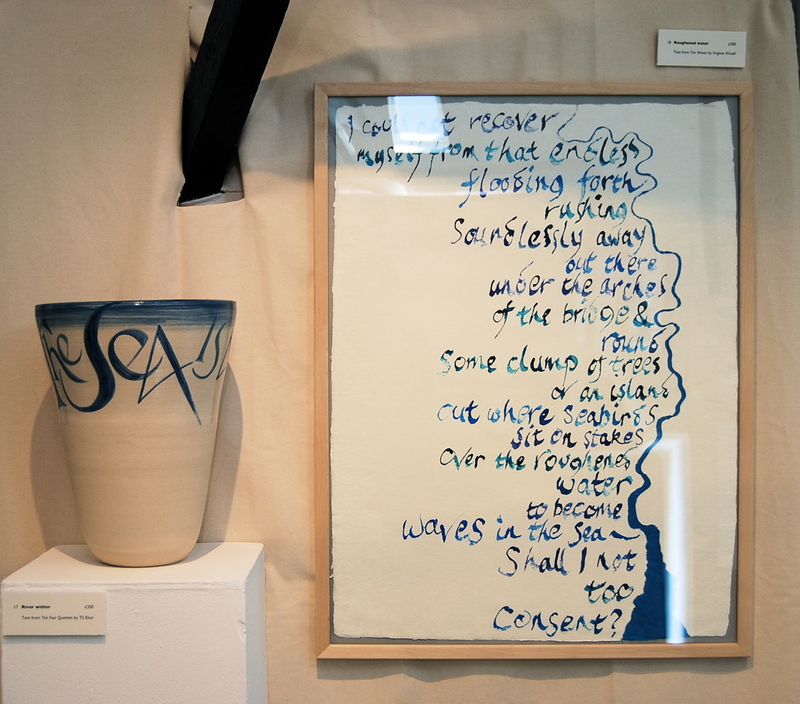 A tall jar, thrown in white stoneware, a very deep blue within and unglazed on the outside except for a tall narrow ‘window’ of the same deep blue. 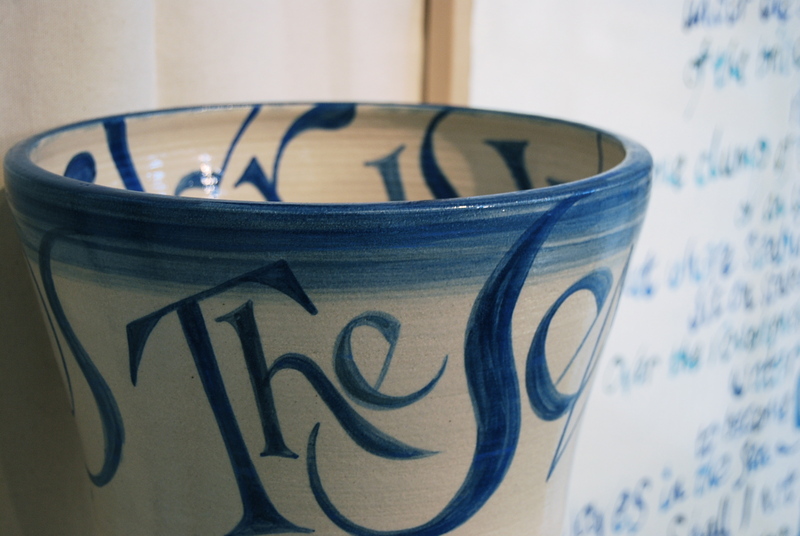 The texture of the unglazed surface contrasts pleasingly with the shining but dark glazed inside – the jar seems filled with dark blue. The simple clean form of the jar, rising from the base to a broad rounded shoulder, refers to Bernard Leach’s idea of the ‘hidden sphere’ in every pot. 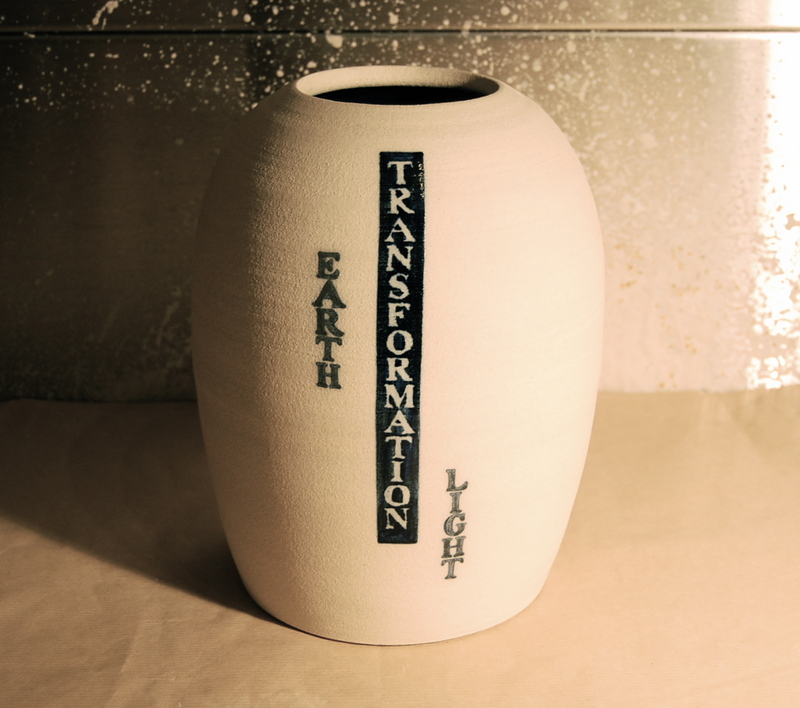 The text refers to the process, the cosmic magical transformation of the clay in the fire, and by extension to our own mysterious cosmic life processes. To buy or enquire about this or any work, please leave me a note in the comments box below or click on contact details.